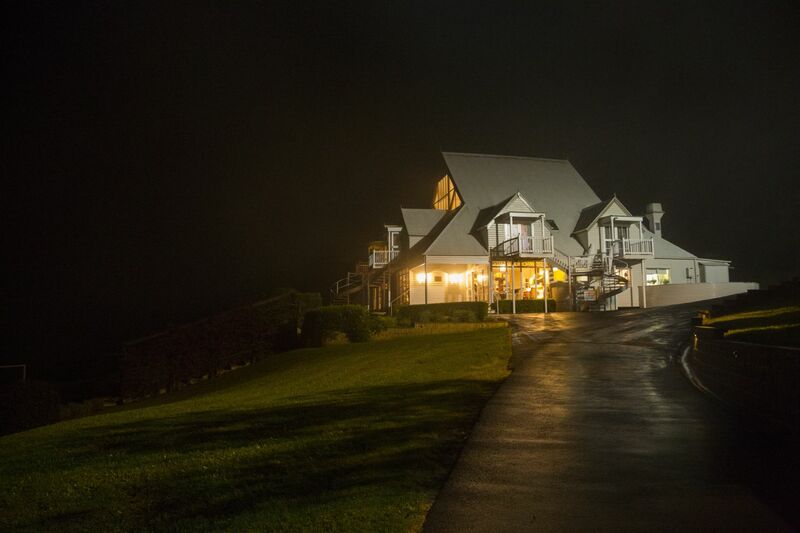 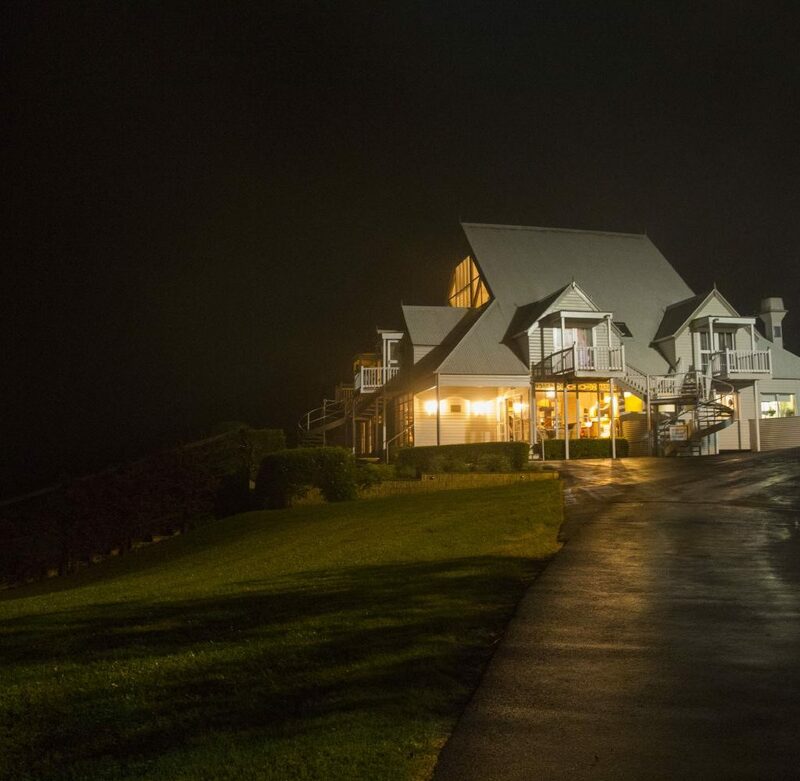 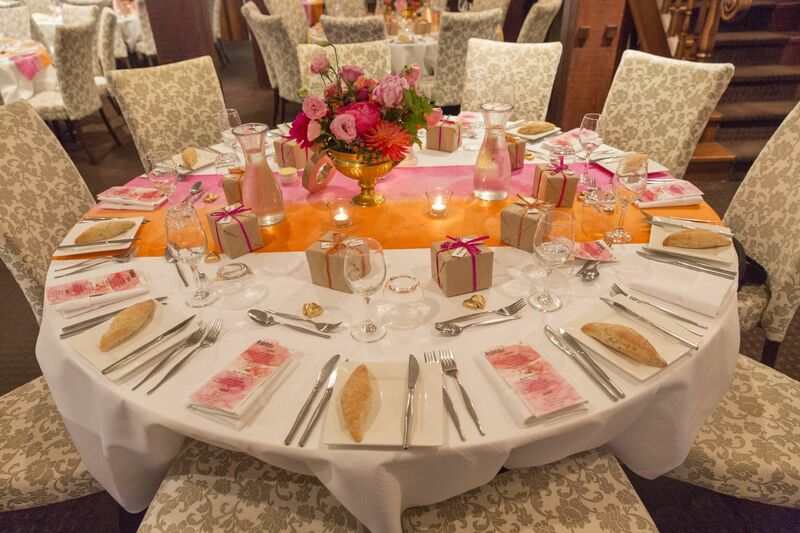 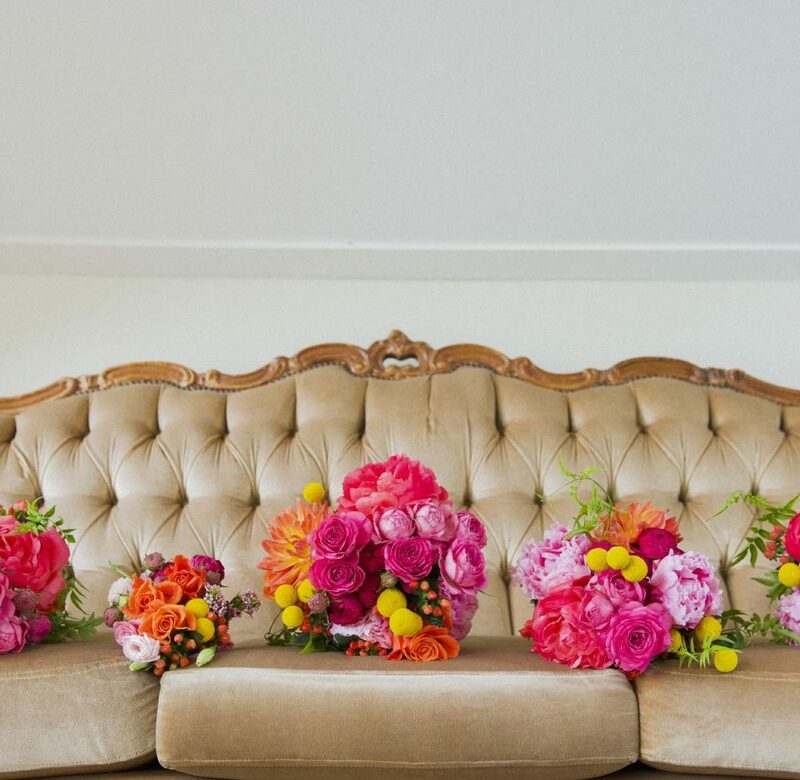 It’s all about the Peony…If you have ever seen the light in a brides eye at the P word you will know wedding dates are booked around this precious bloom’s availability. 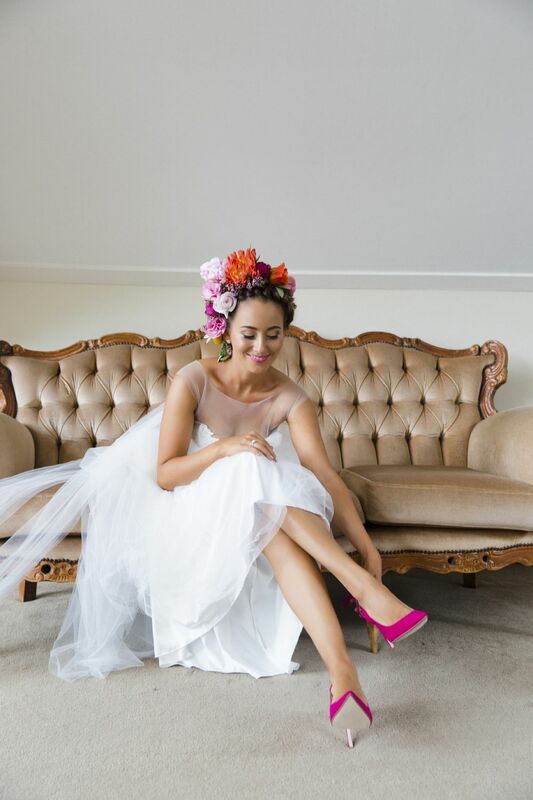 This was the base of this beautiful ,bright palette against a blush base, a total fiesta of fun. 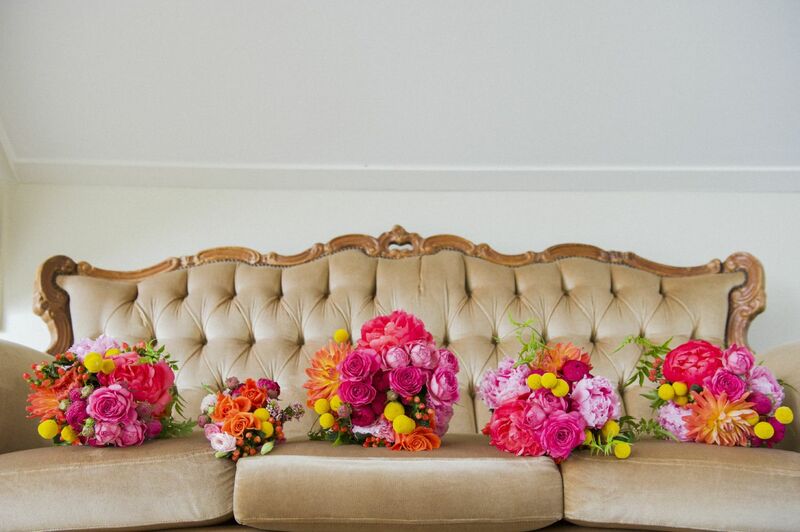 Turn away now lest you also come under the spell of this intoxicating bloom! 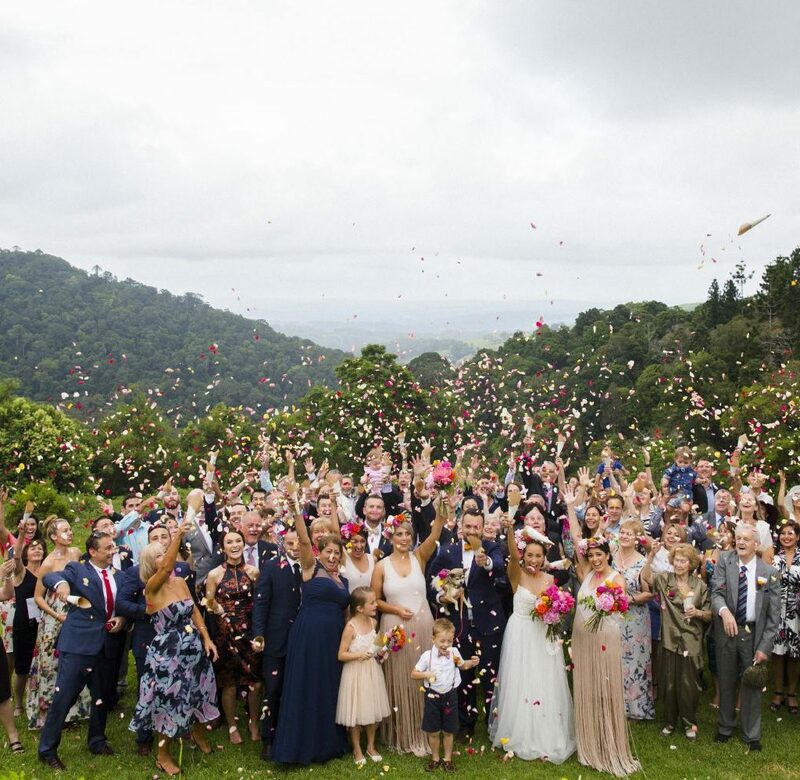 Oh and in Australia, November is the peak month for this precious cargo sometimes starting early in October and then nudging into the first week of December if you are super lucky. 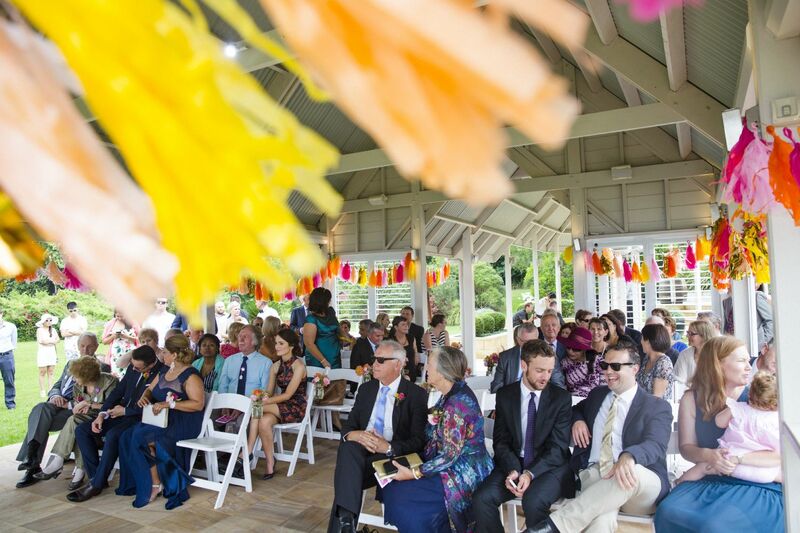 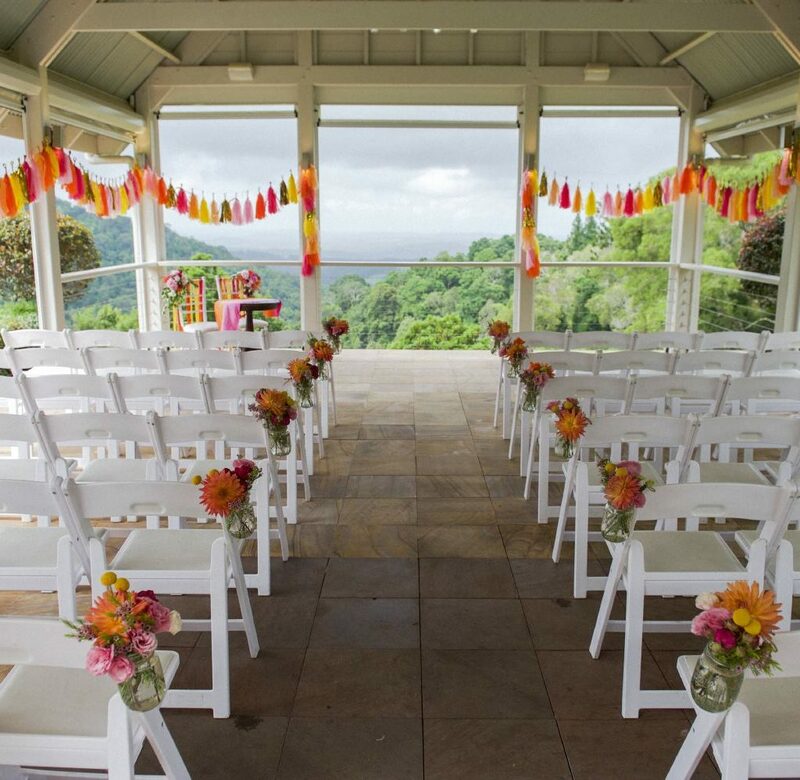 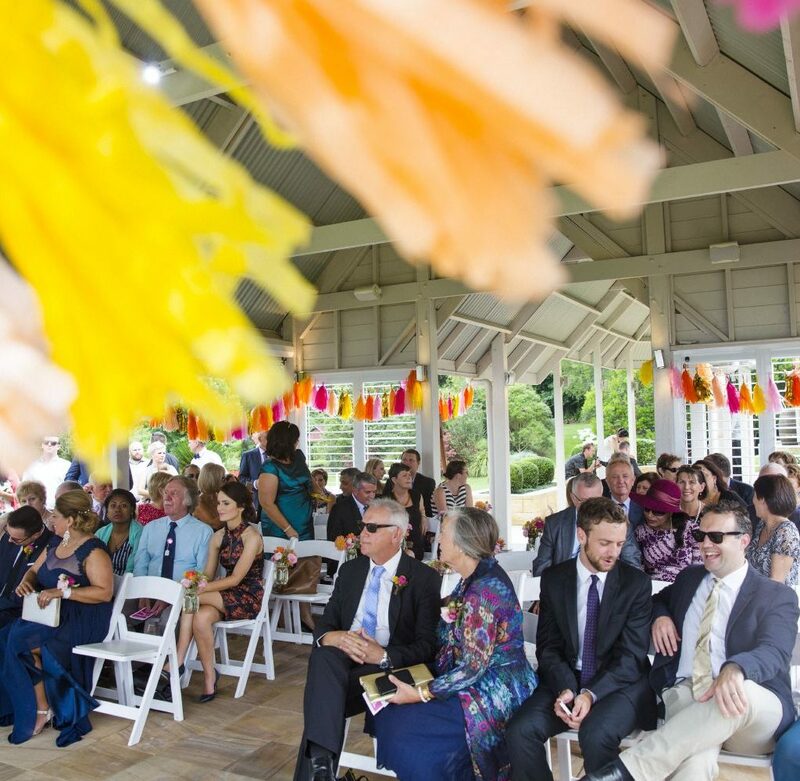 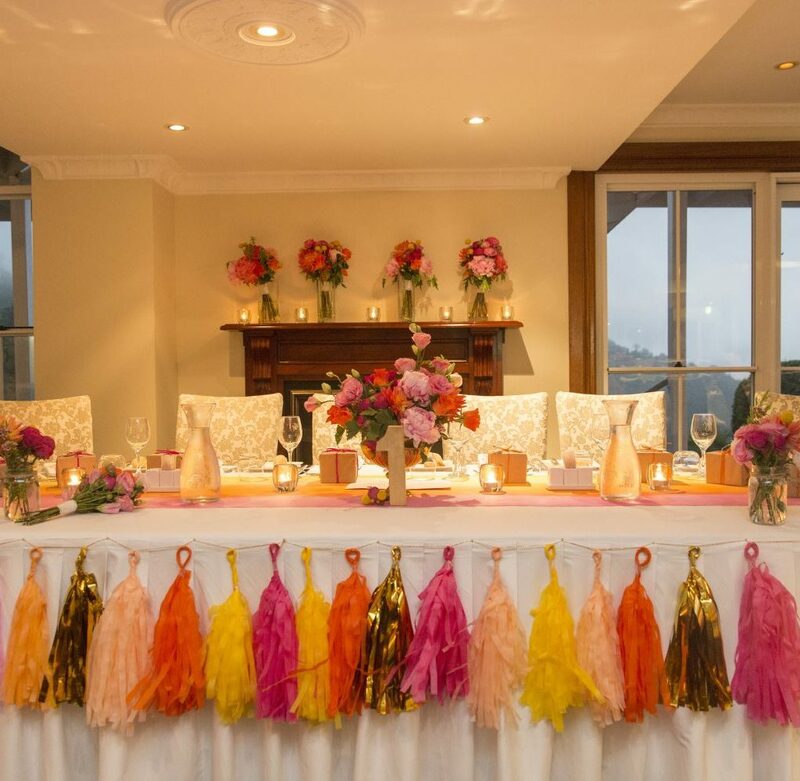 Add one very creative Bride who is also a great cook as much as she is a craft demon, with hand dying table runners and stringing together her own hand crafted streamers, no buying online for this lady. 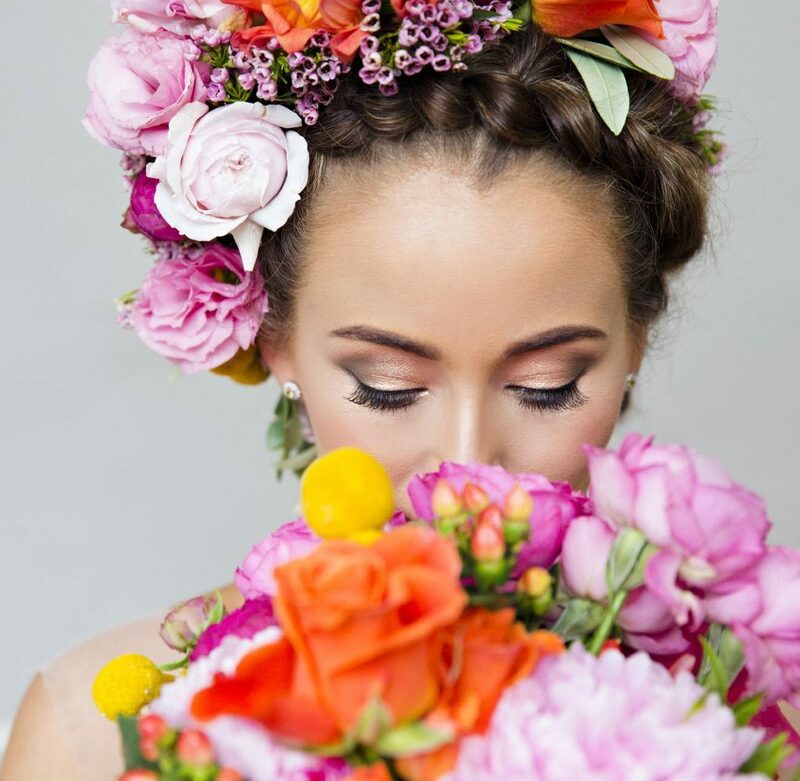 All for a gorgeous gal that normally rocks a hard hat! 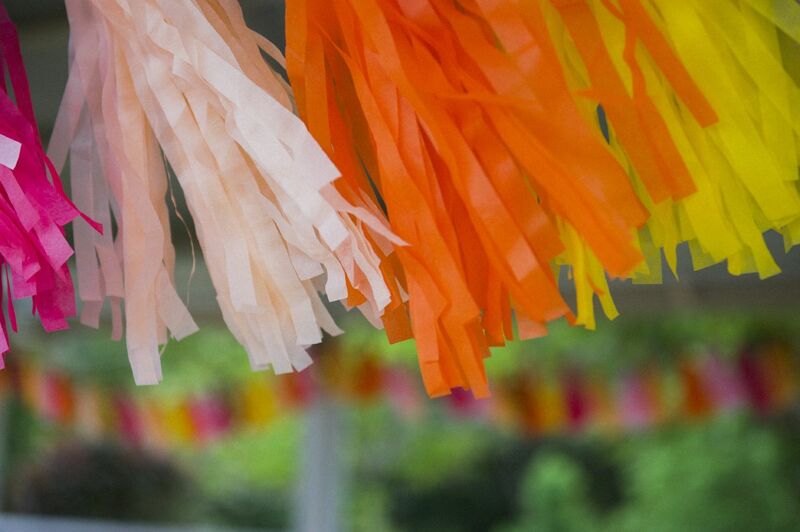 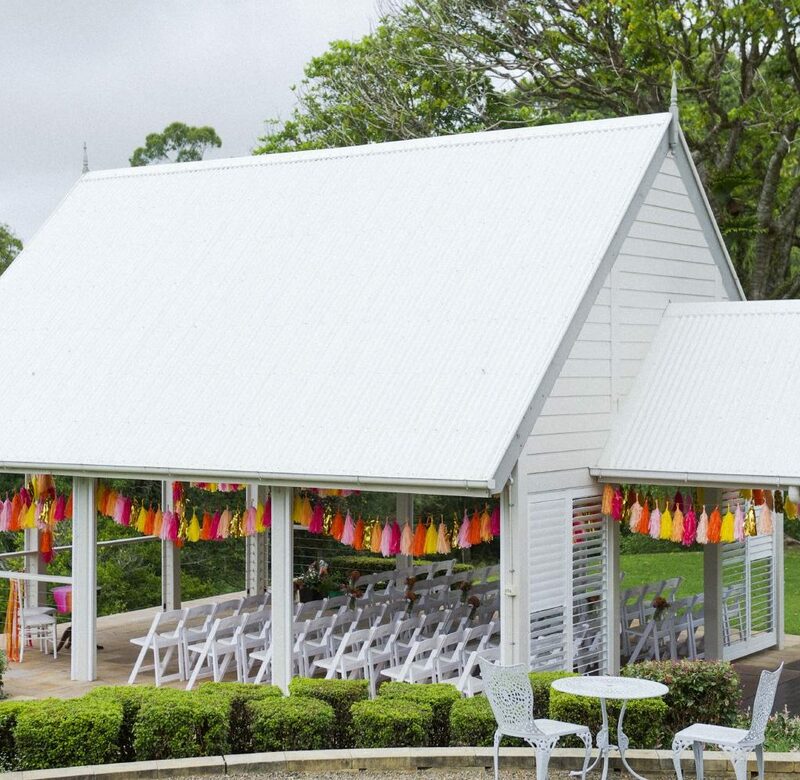 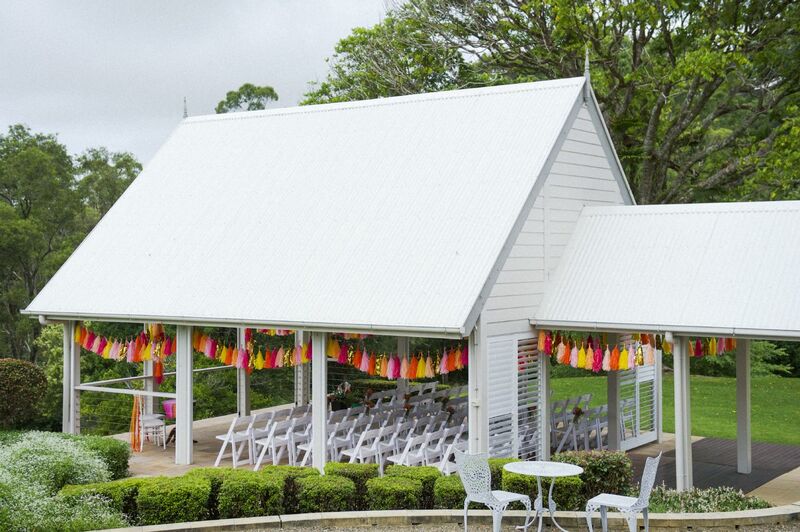 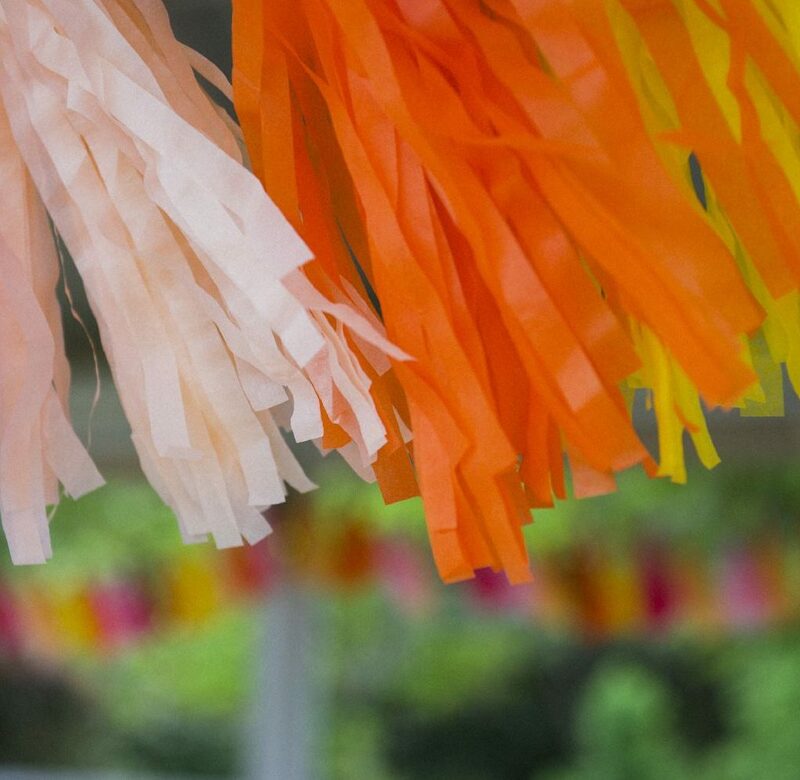 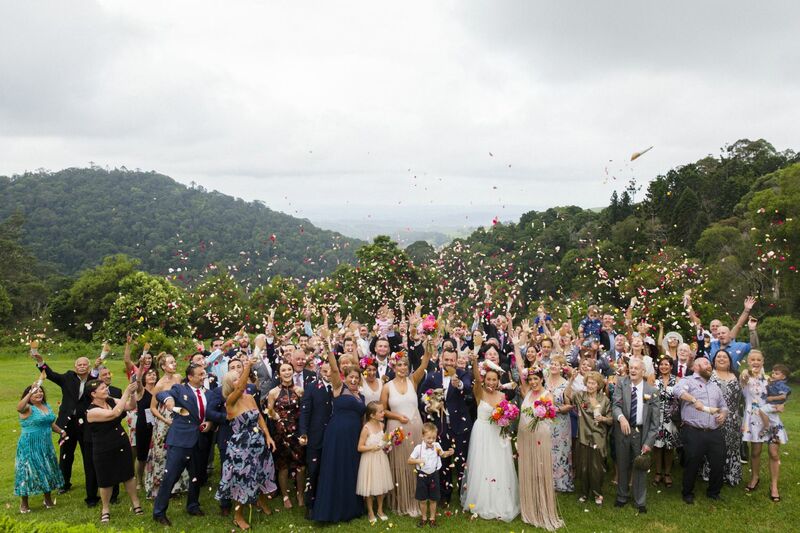 Add in a great family of helpers,some fabulous entertainment, the bright red Kombi from Deluxe Kombi Service and we had our own special Maleny Fiesta with the pavilion decked in streamers of pink ,yellow, orange,blush and gold. 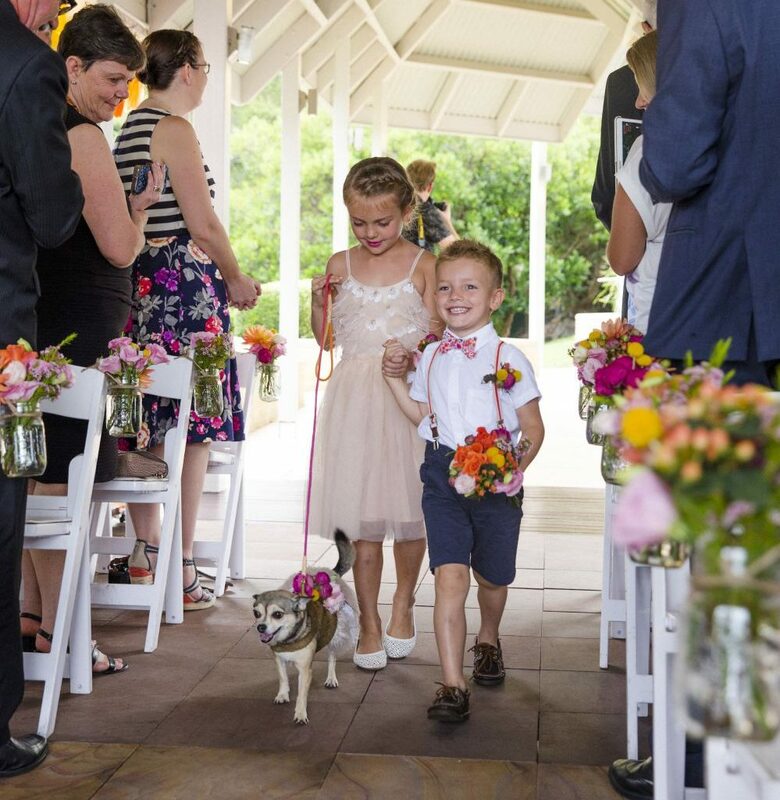 Beautiful Apples was the Flower Girl Puppy , we think she was smiling on the inside, in her very chilled pup way, her specially crafted outfit was also made by the Bride. 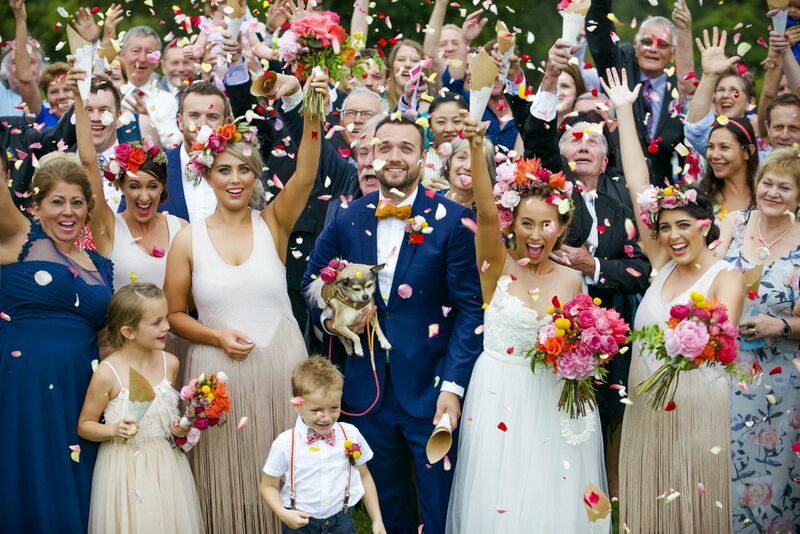 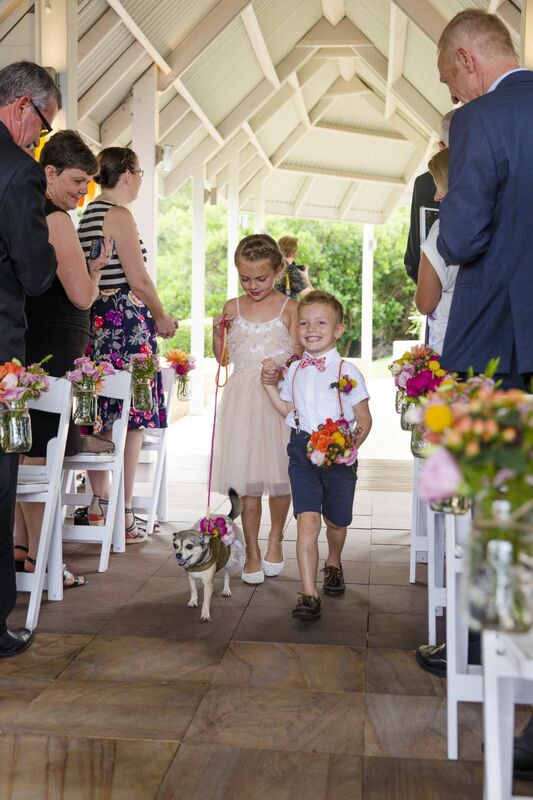 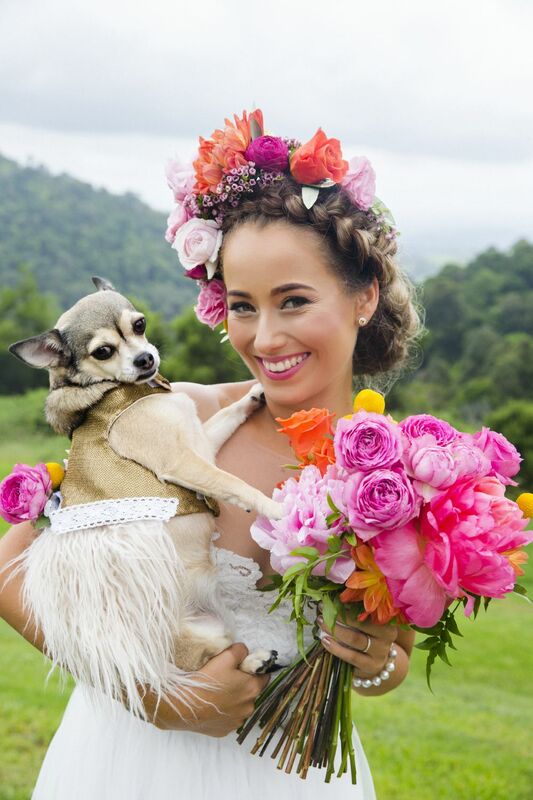 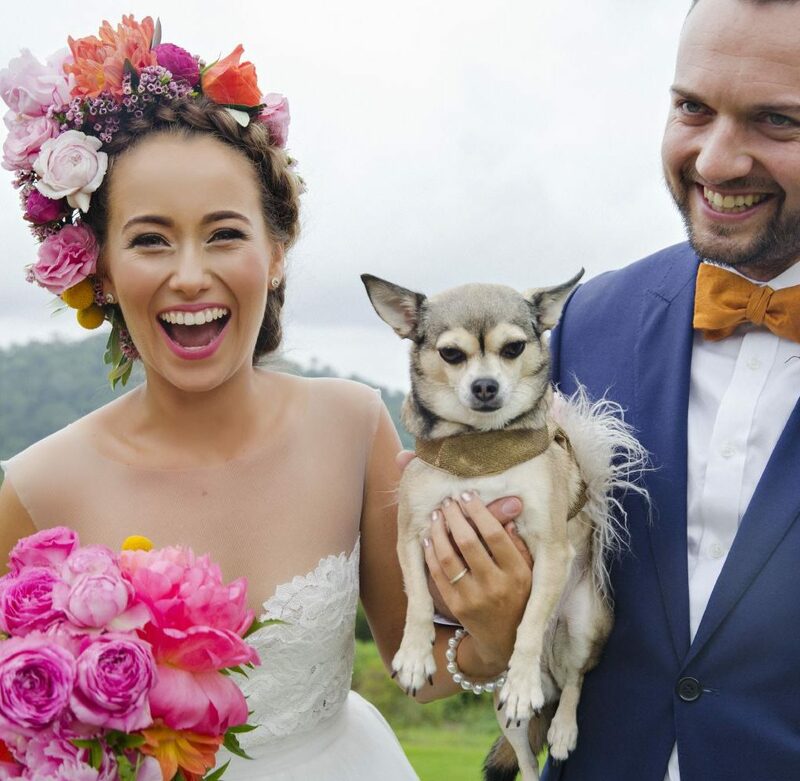 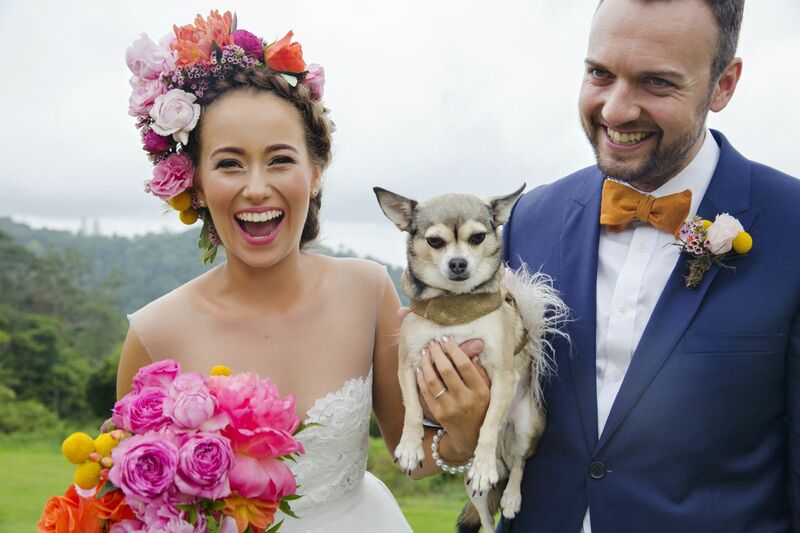 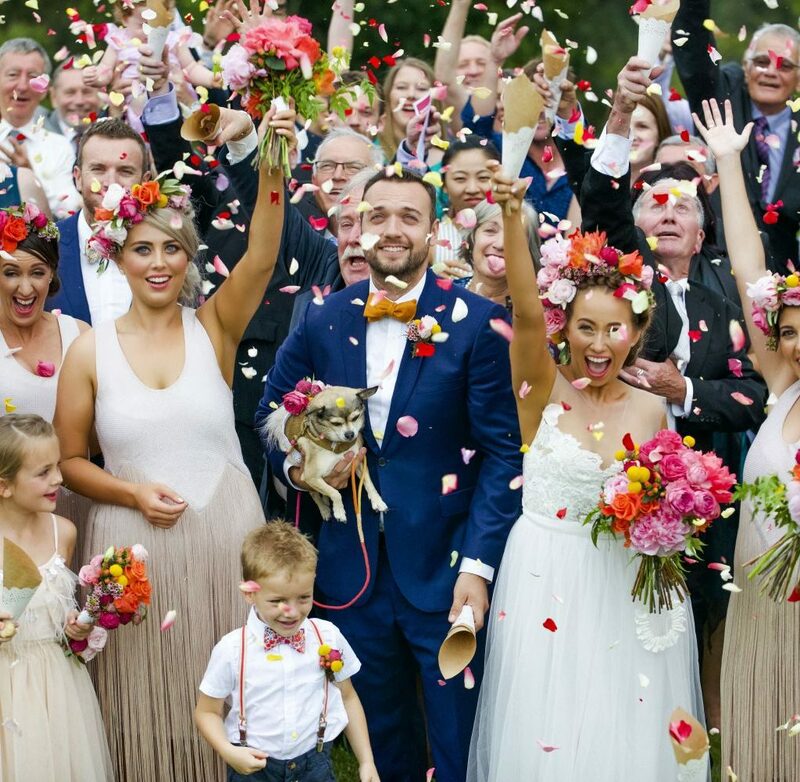 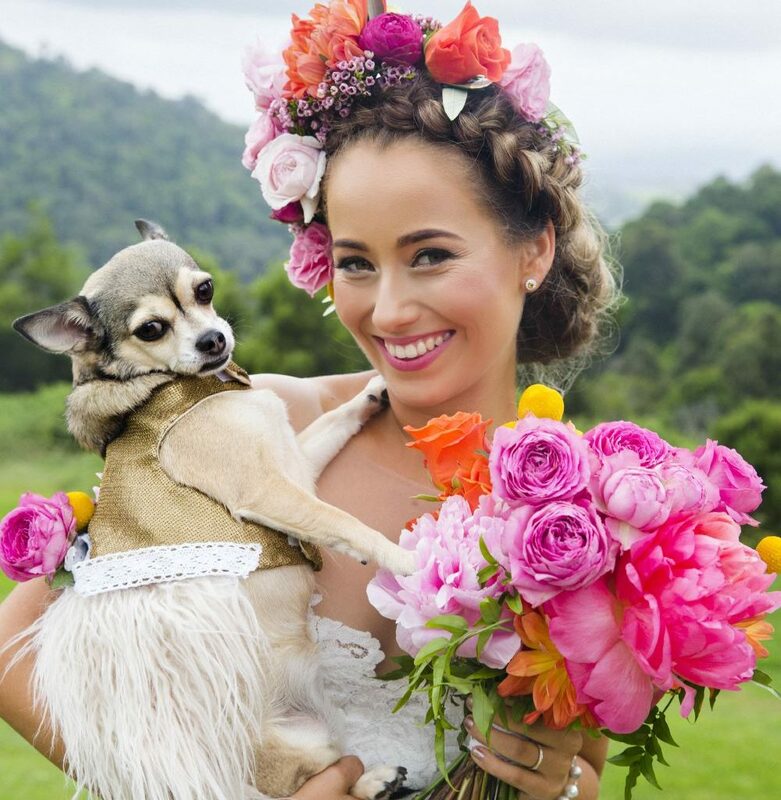 Puppies are such a big focus of our couples day’s and China the owl delivered the wedding rings in style swooping in as a surprise down the aisle. 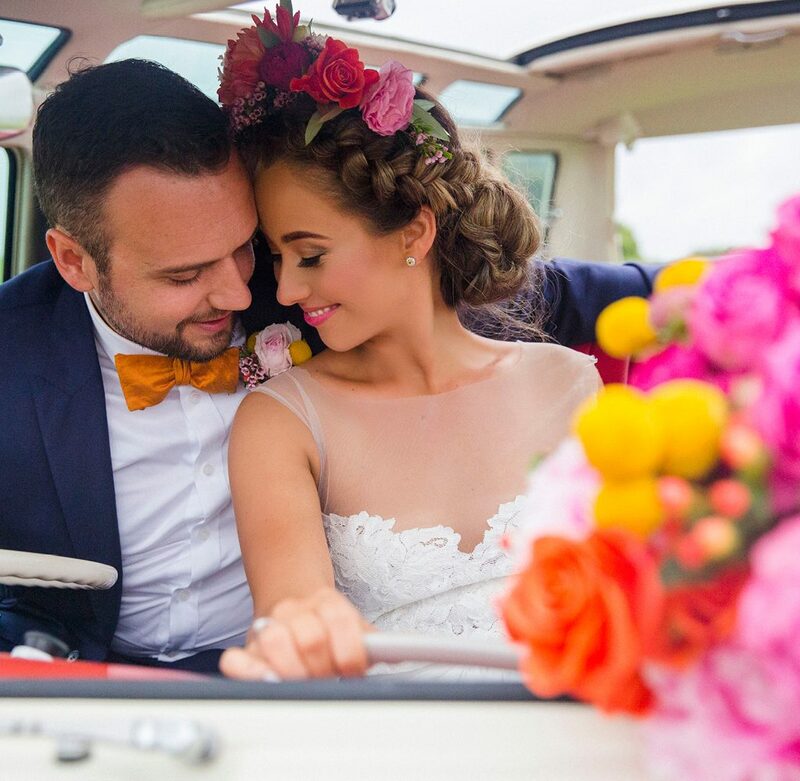 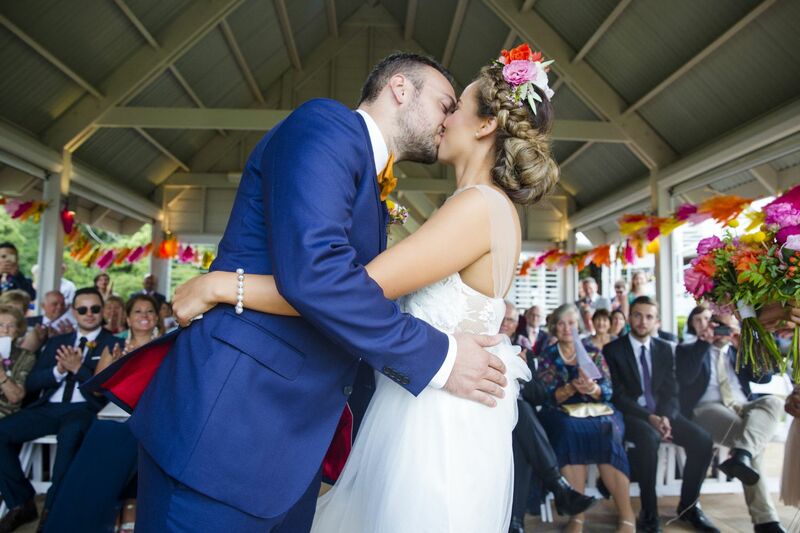 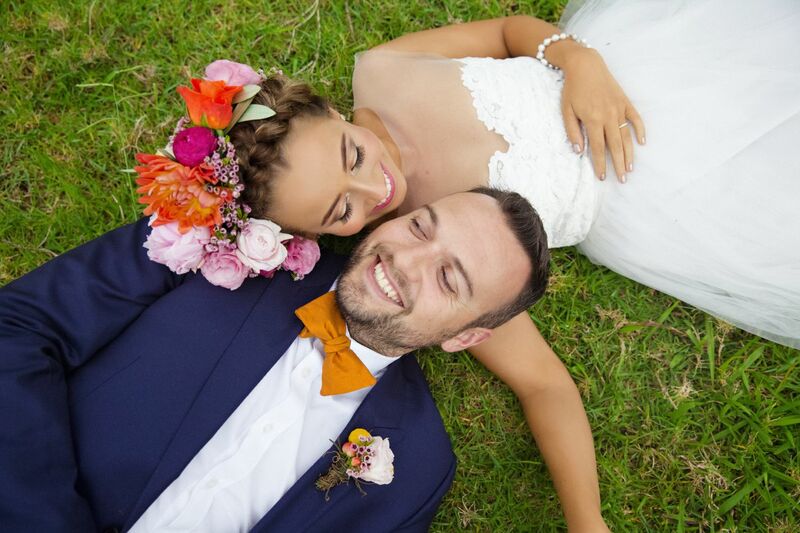 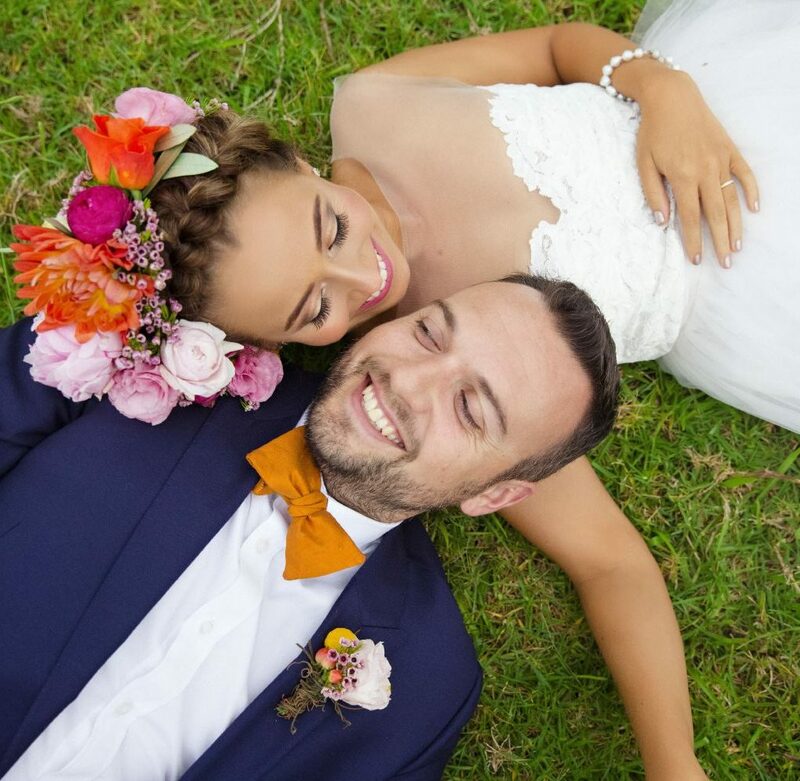 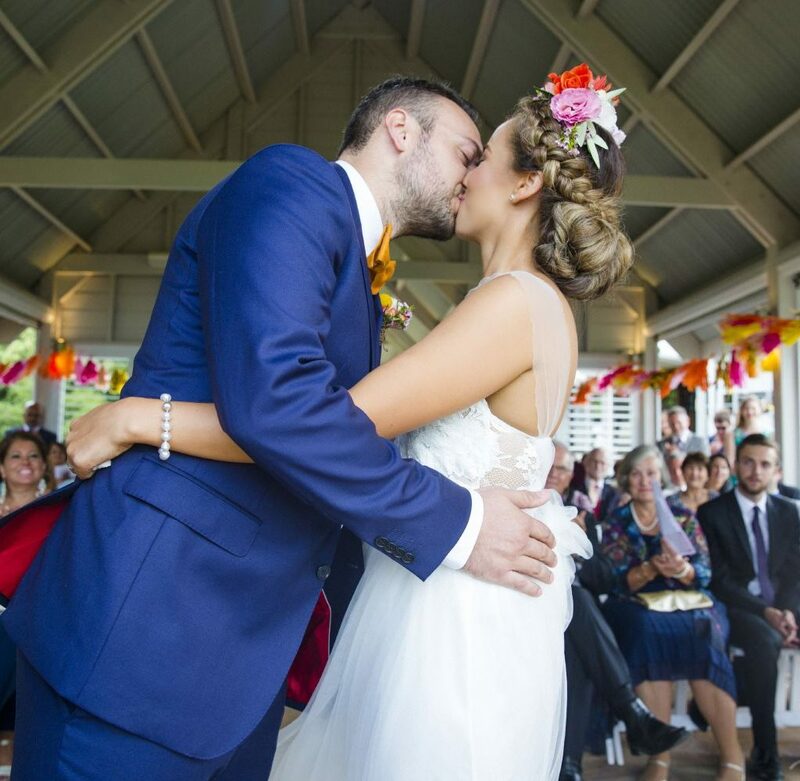 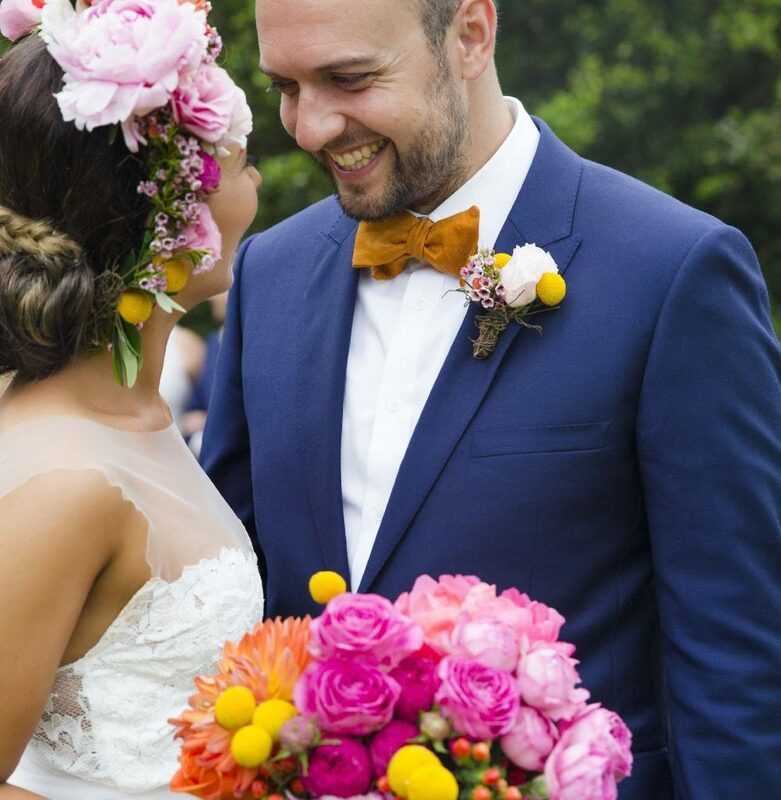 As you can see beaming from these beautiful bright images, high on the list for Tamara and Tim was fun and family, love and respect, when you add in all those ingredients with a giant pop of colour , you are on a winner for your wedding day. 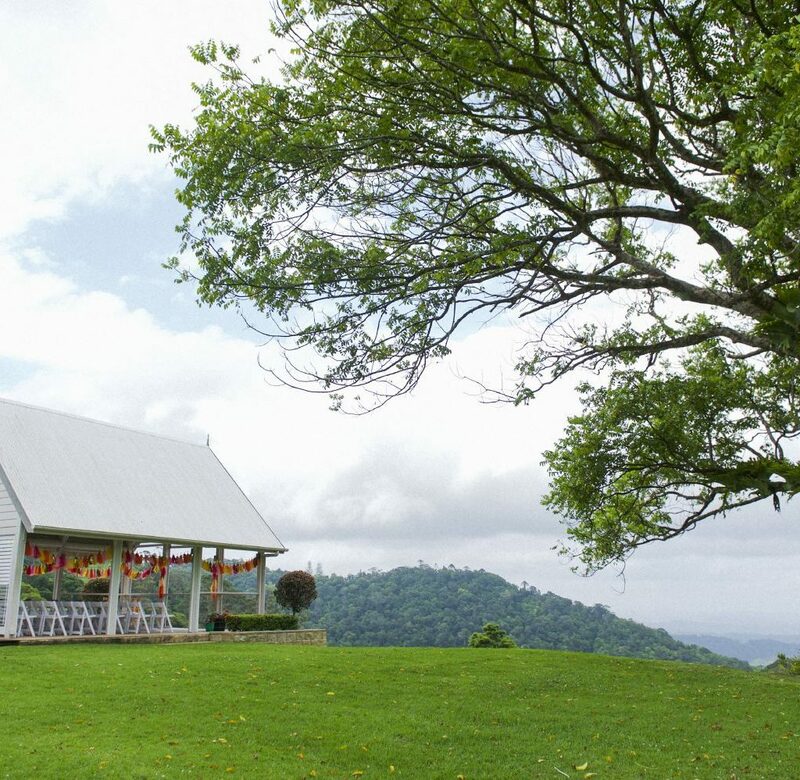 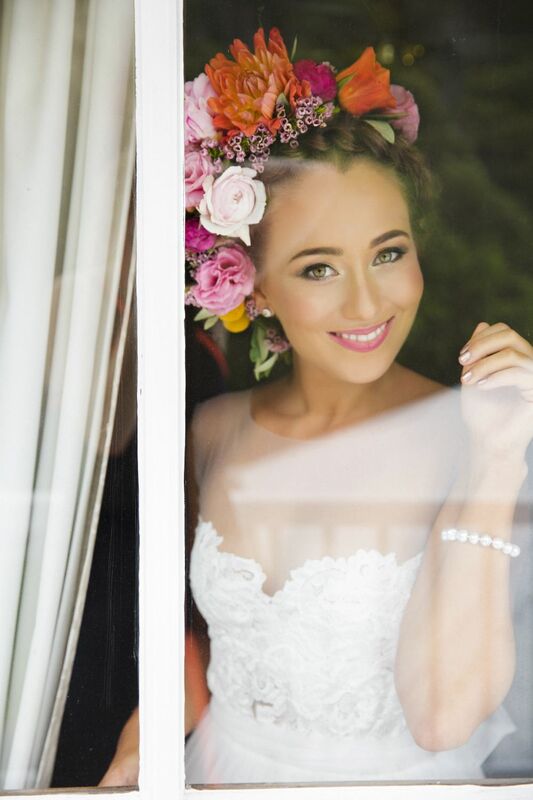 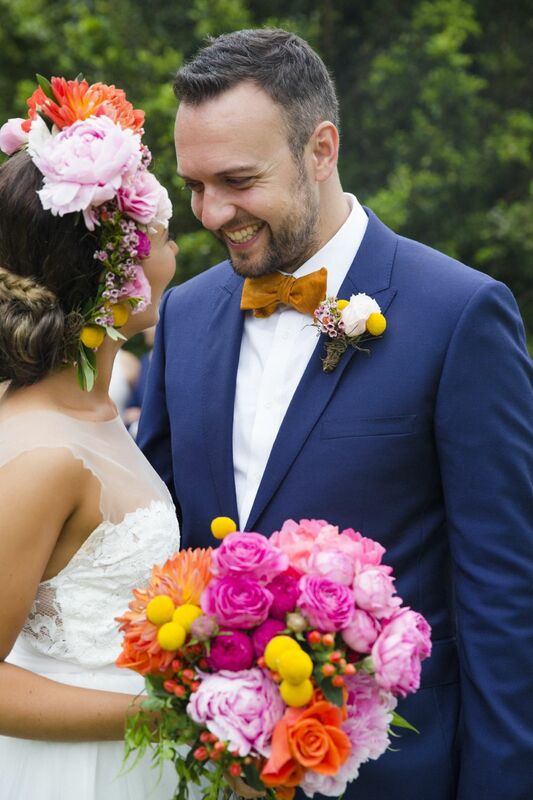 In the words of our In House Super Star Mondo Floral Designs as this wedding was all created from the florals up! 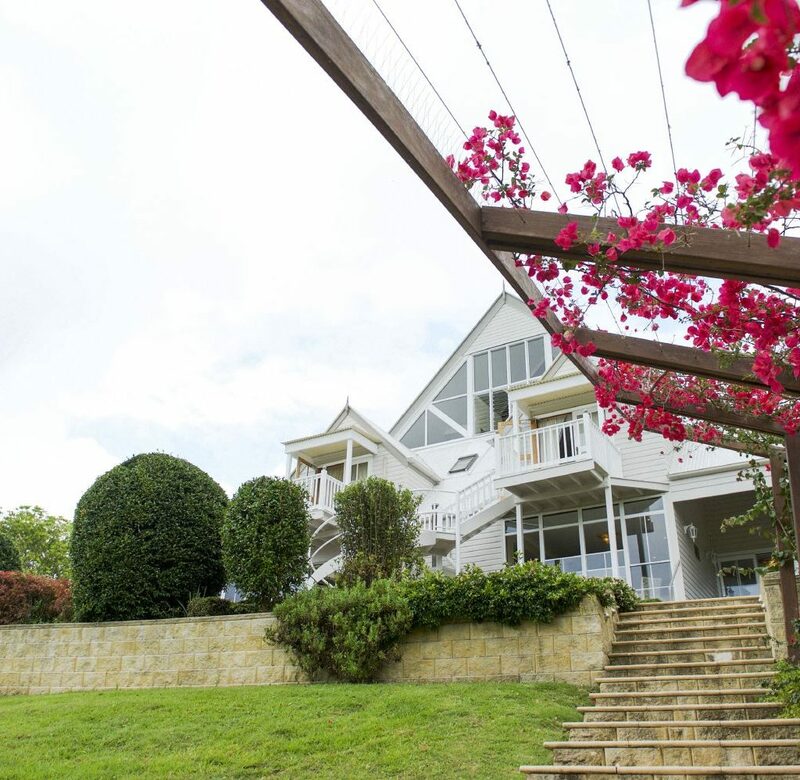 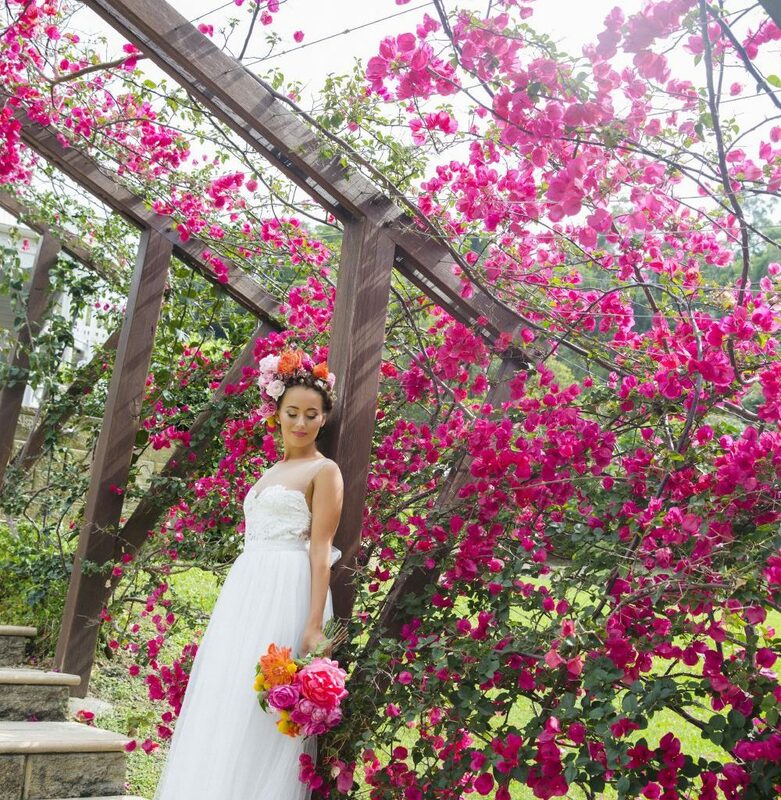 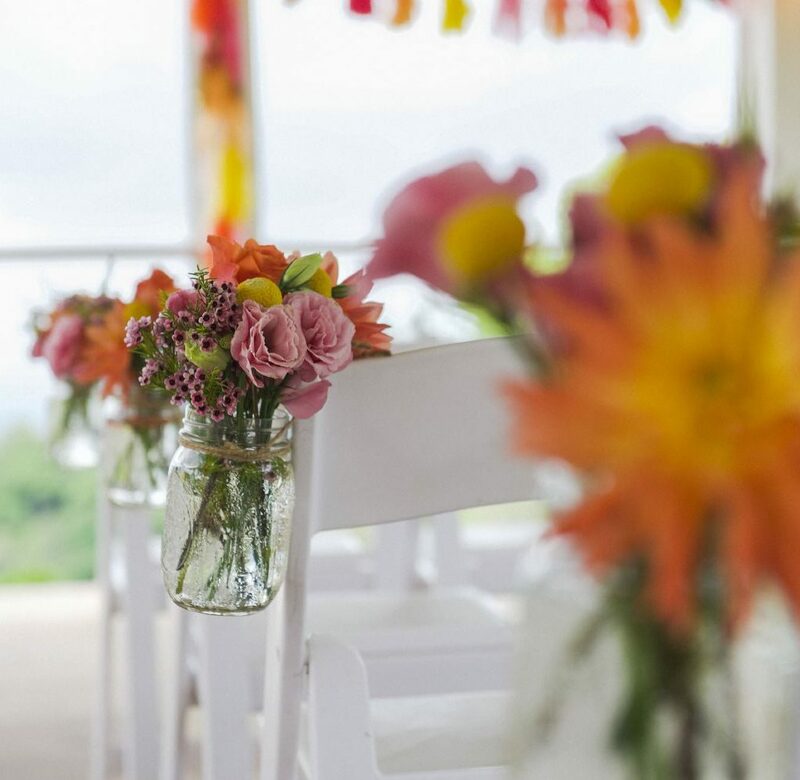 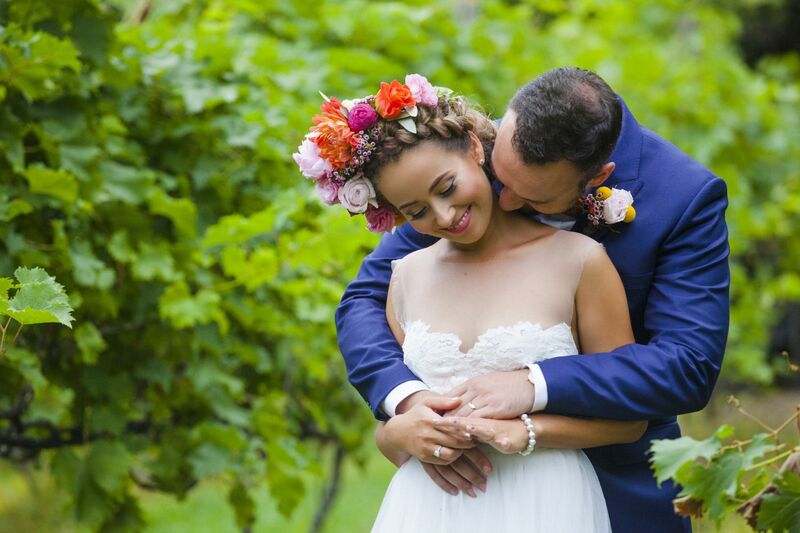 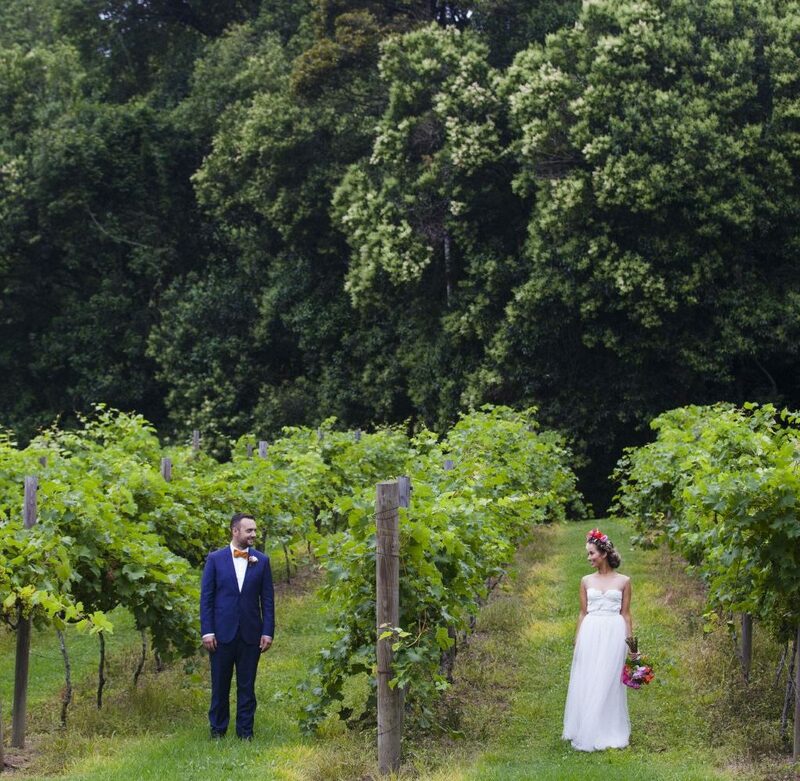 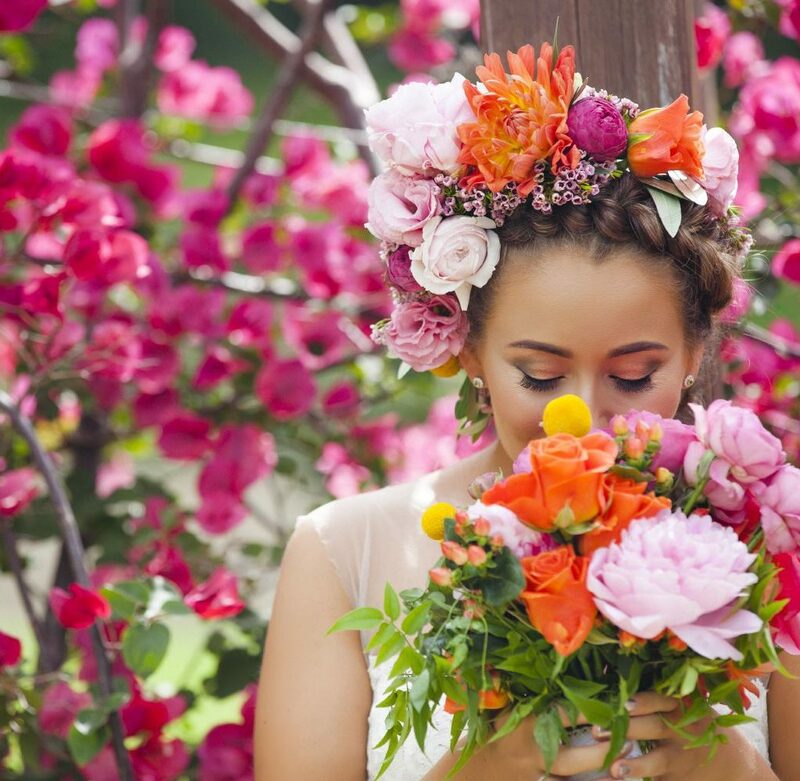 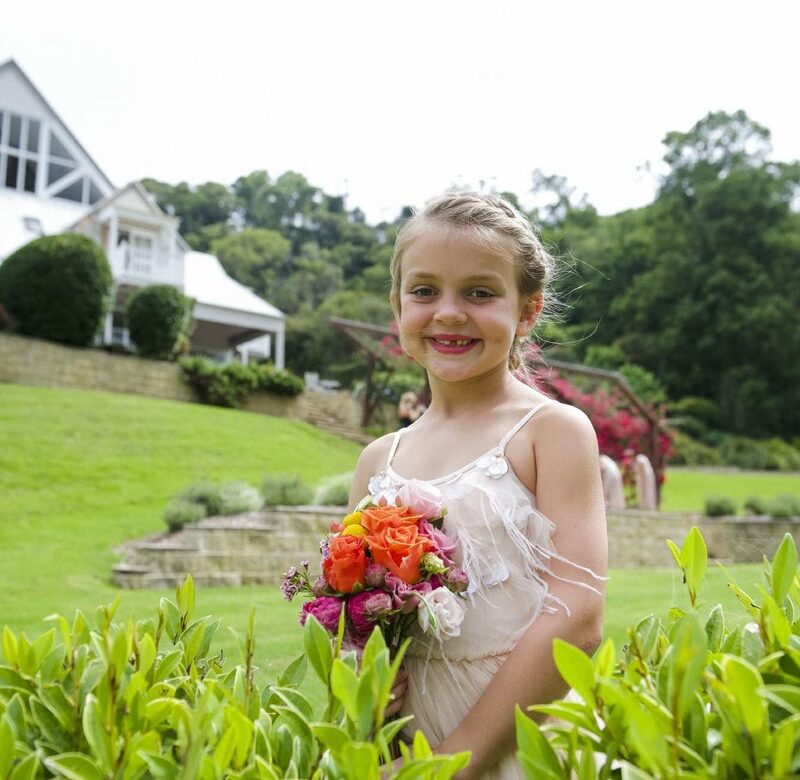 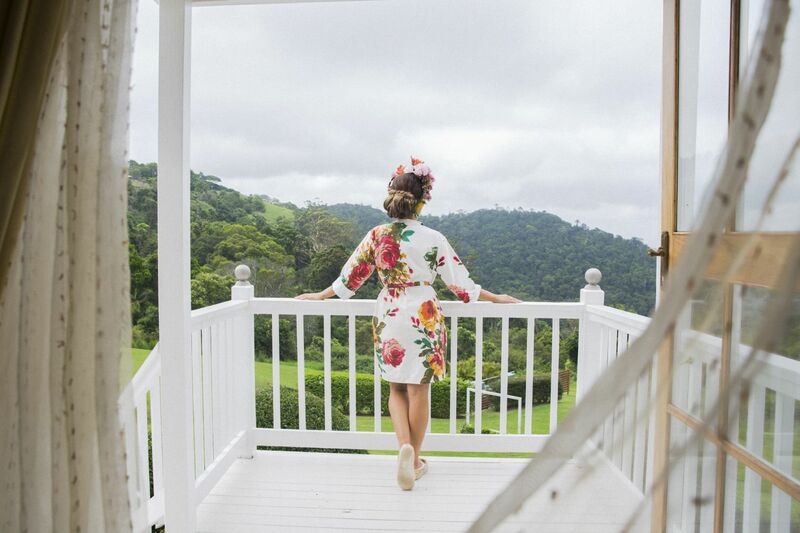 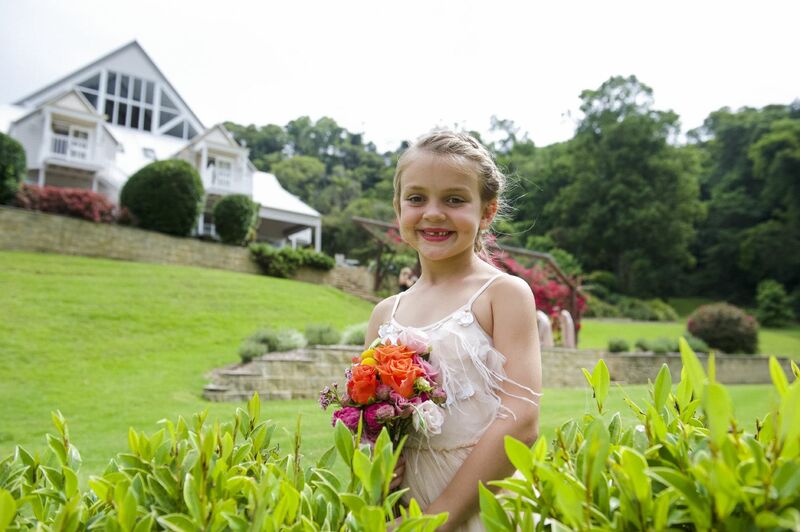 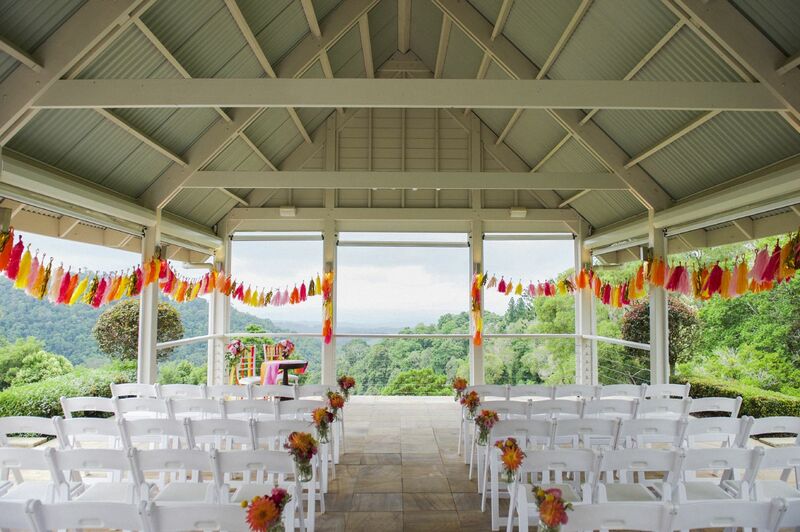 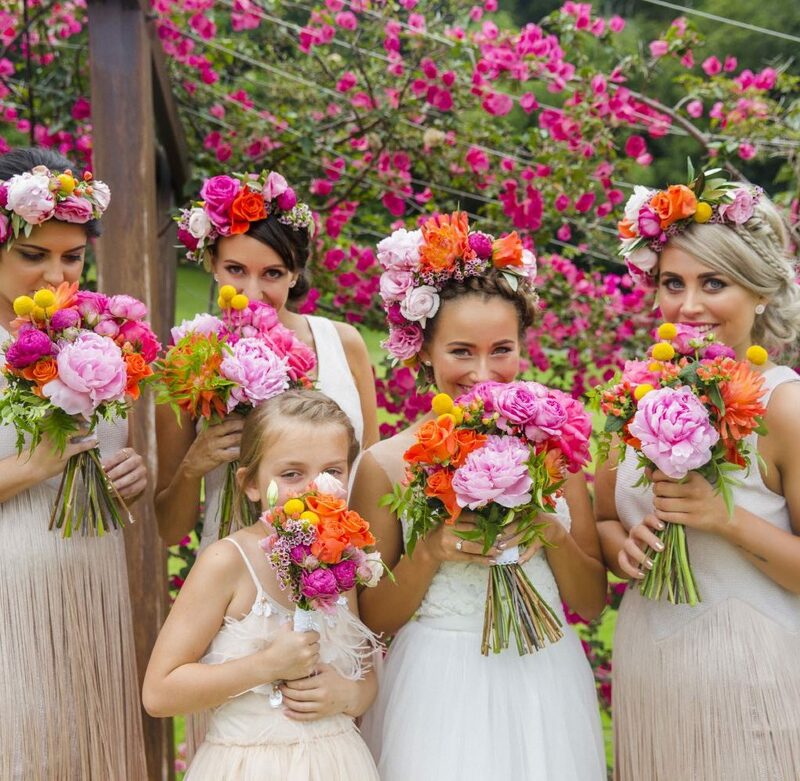 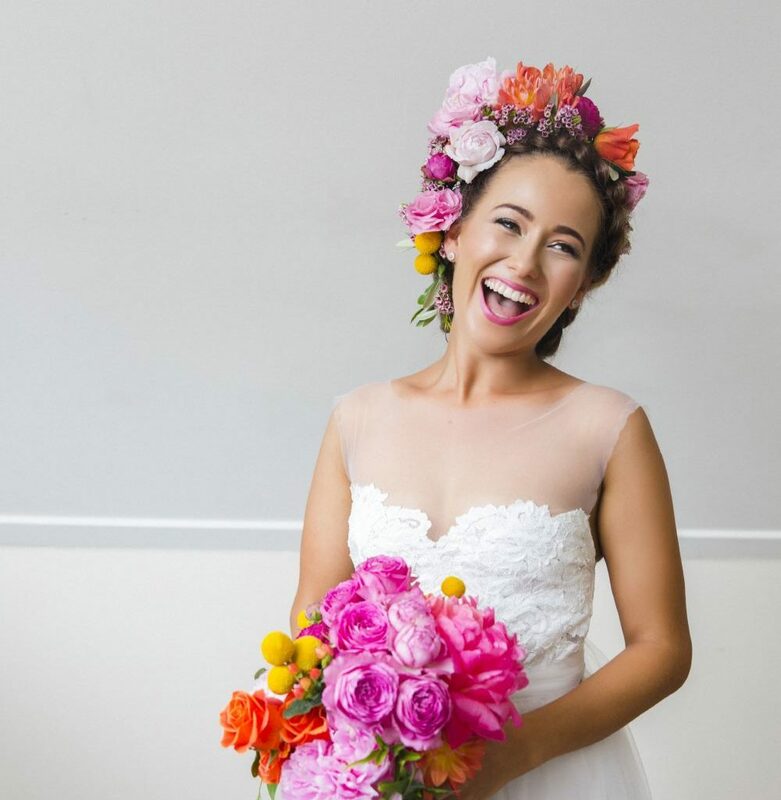 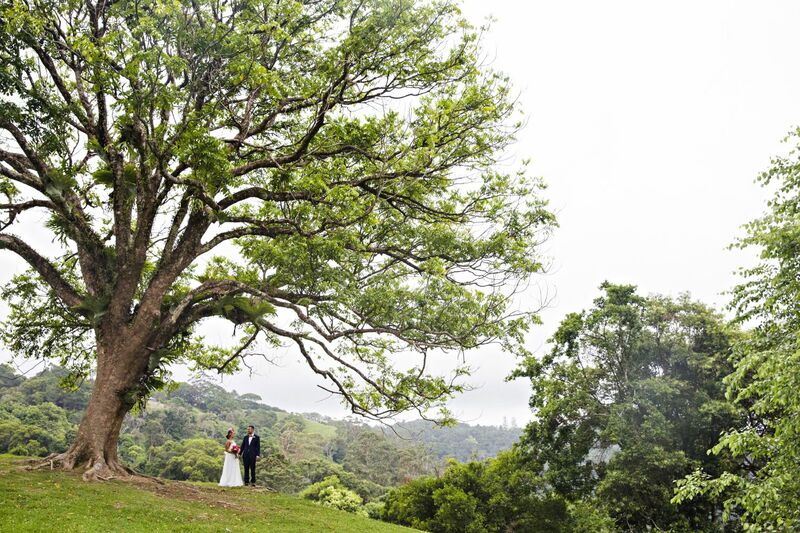 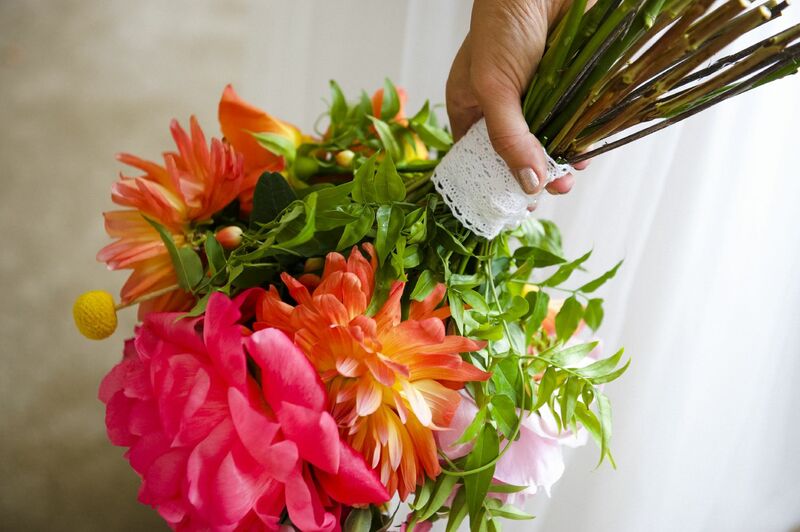 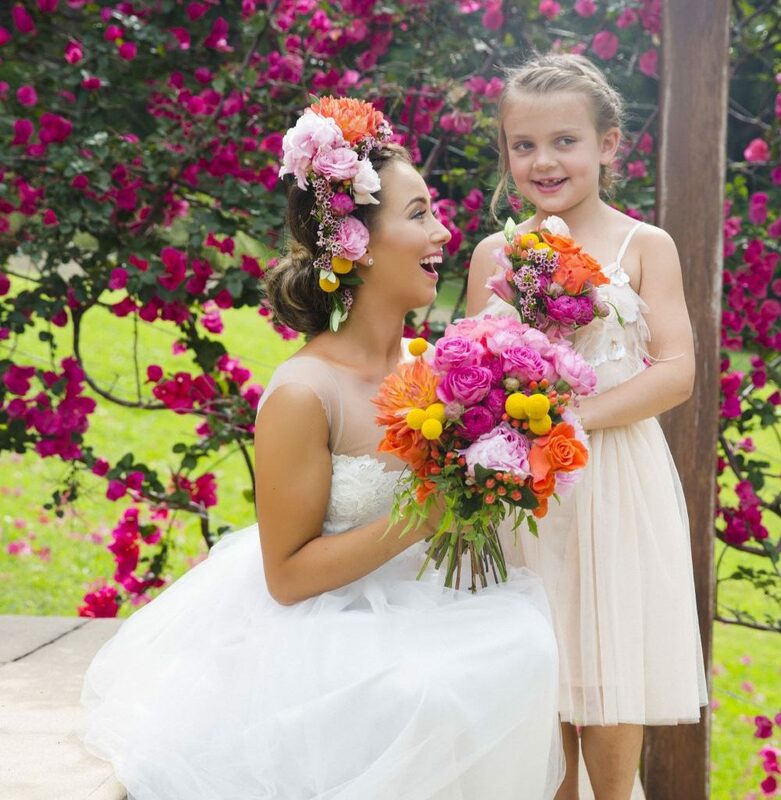 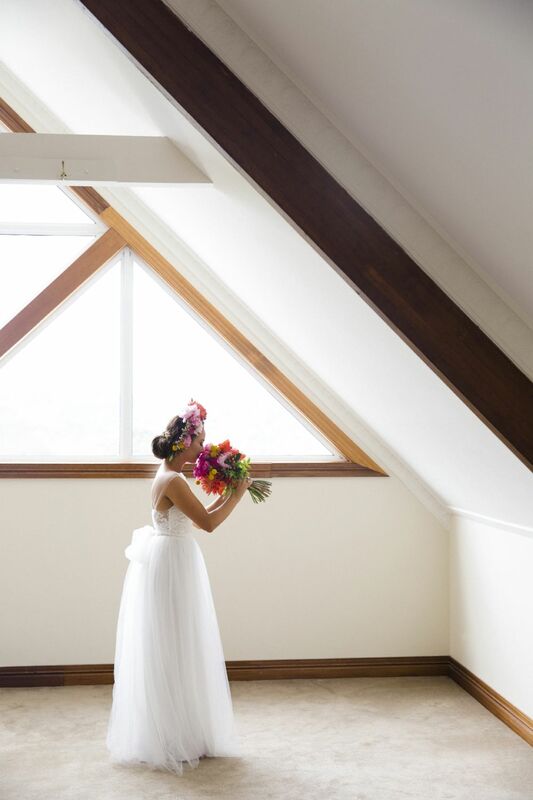 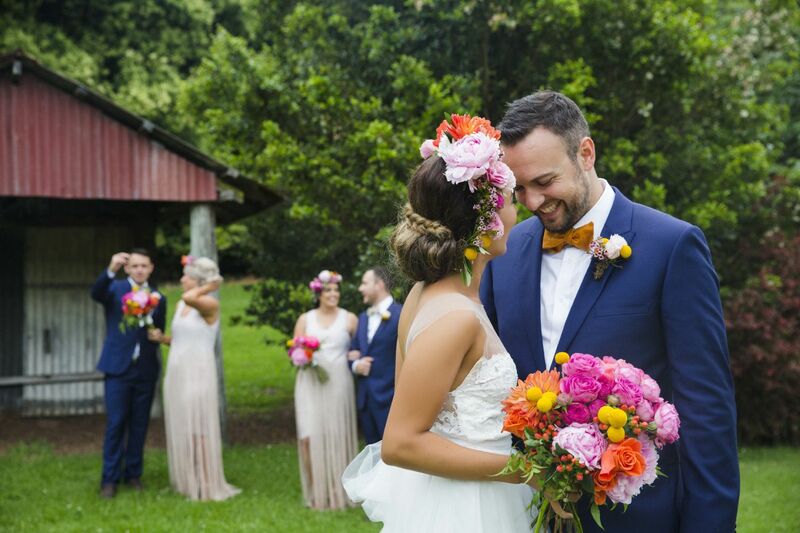 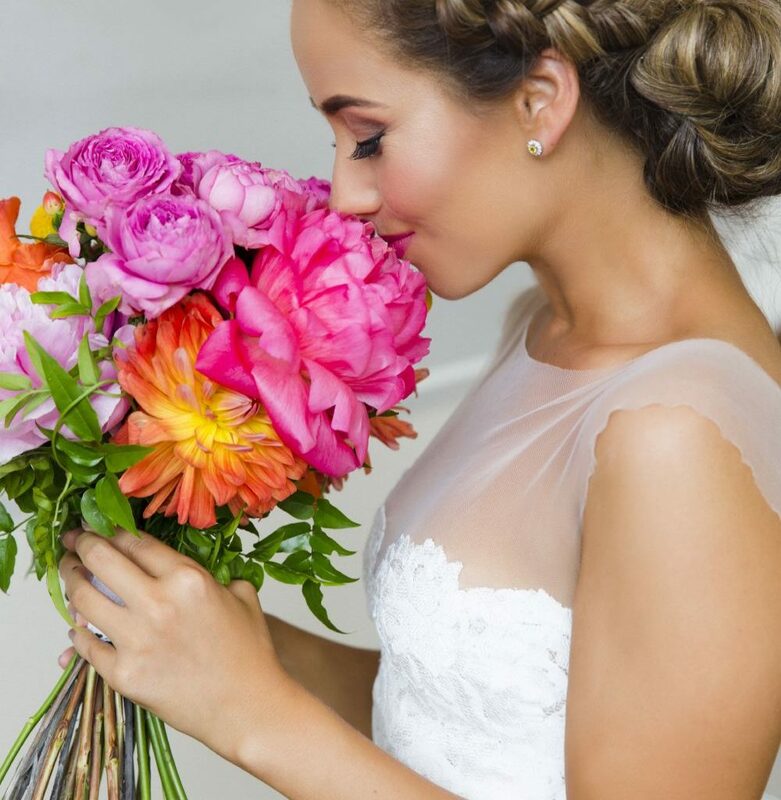 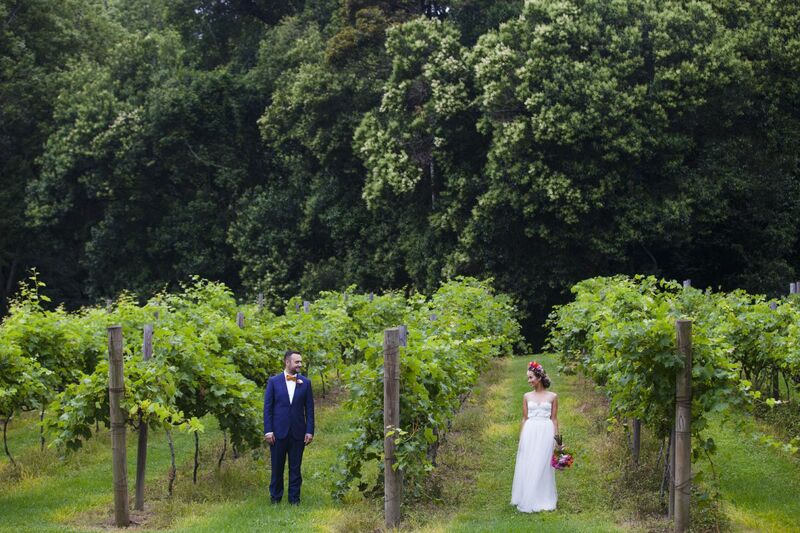 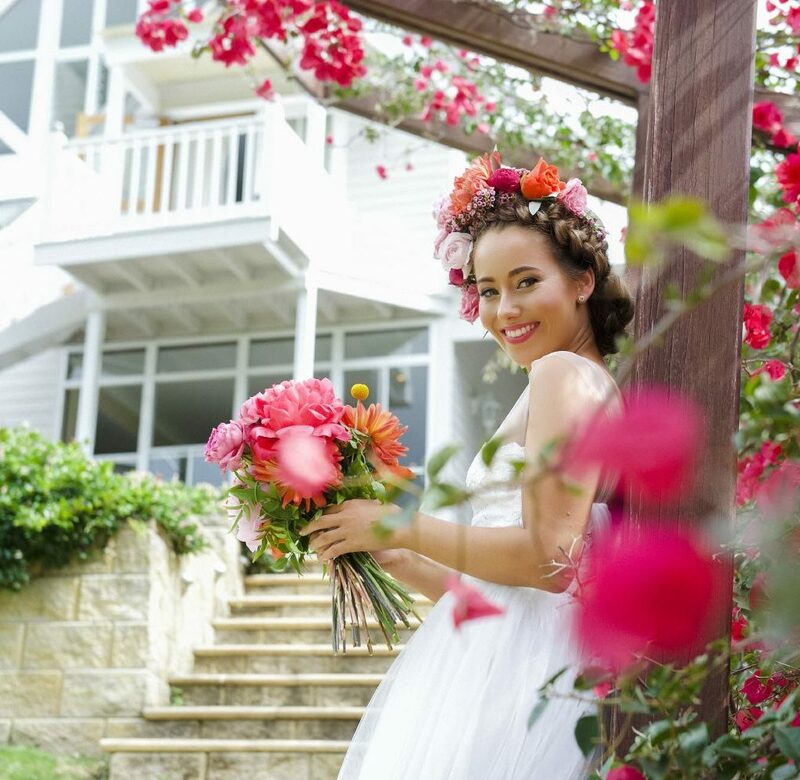 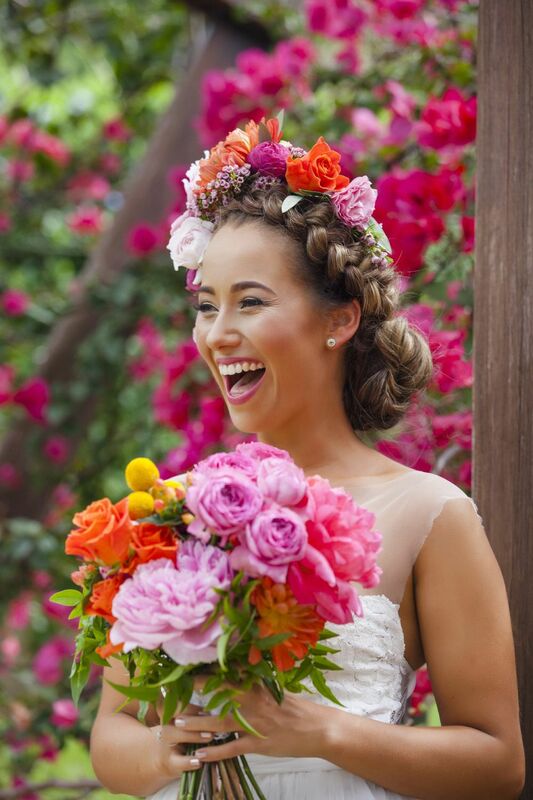 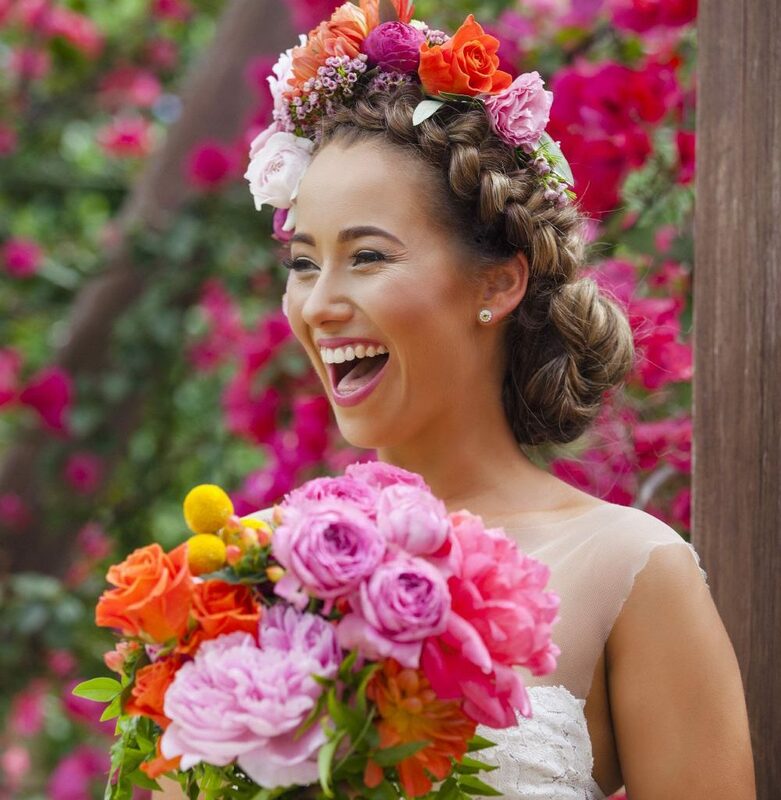 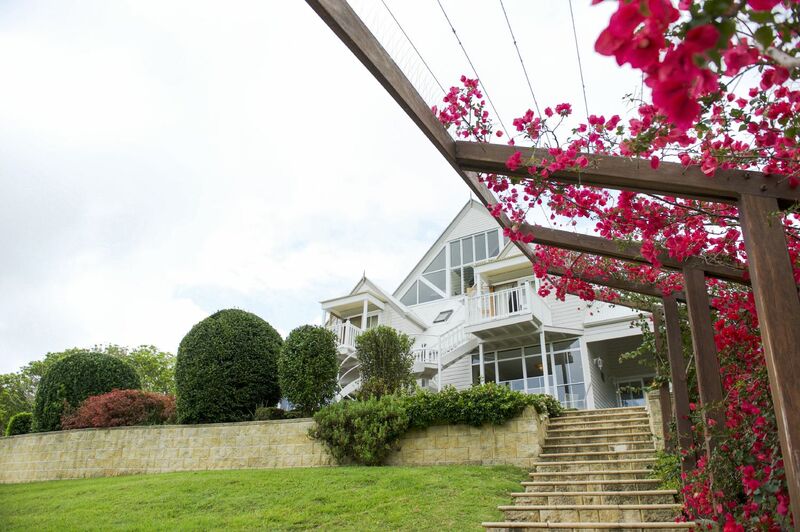 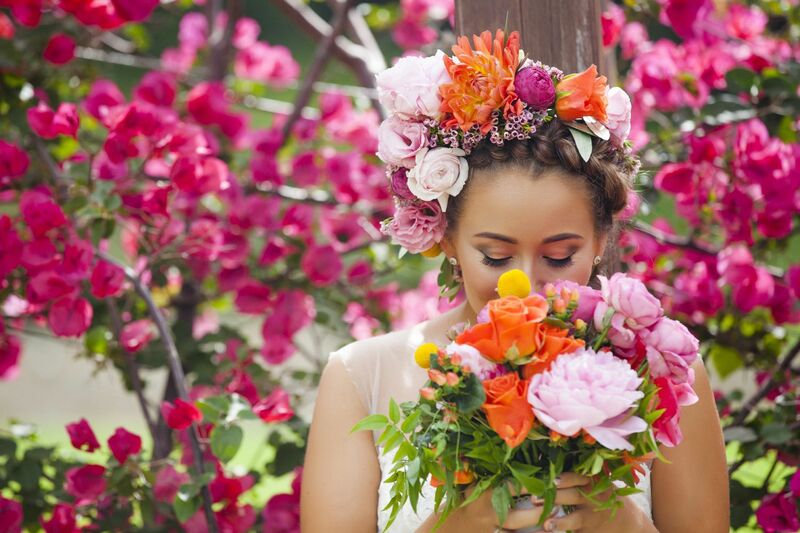 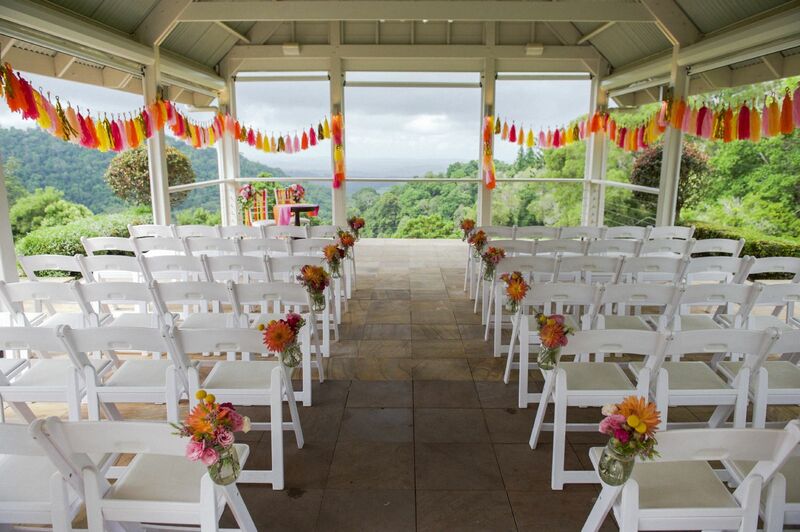 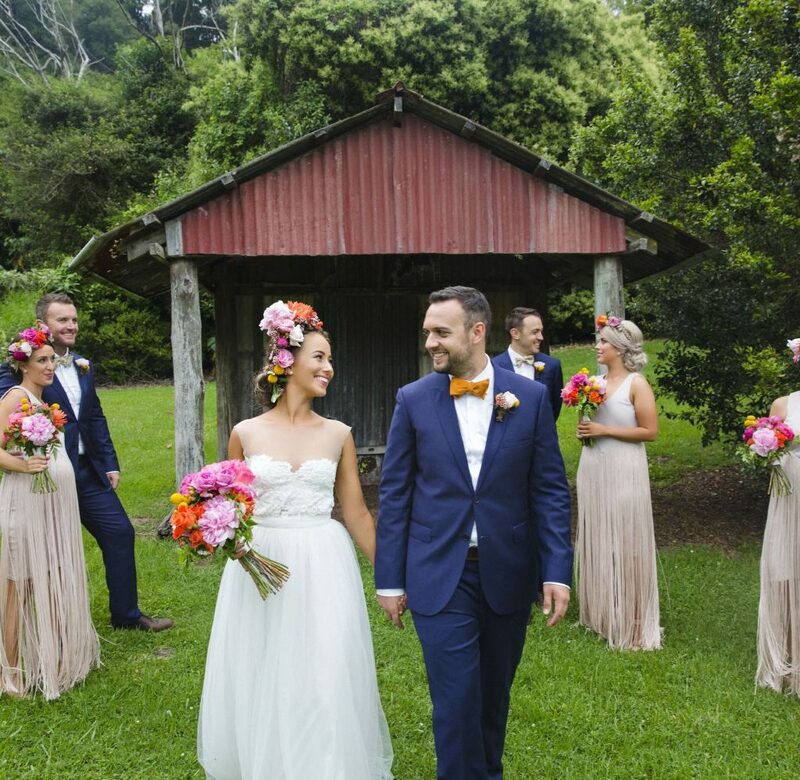 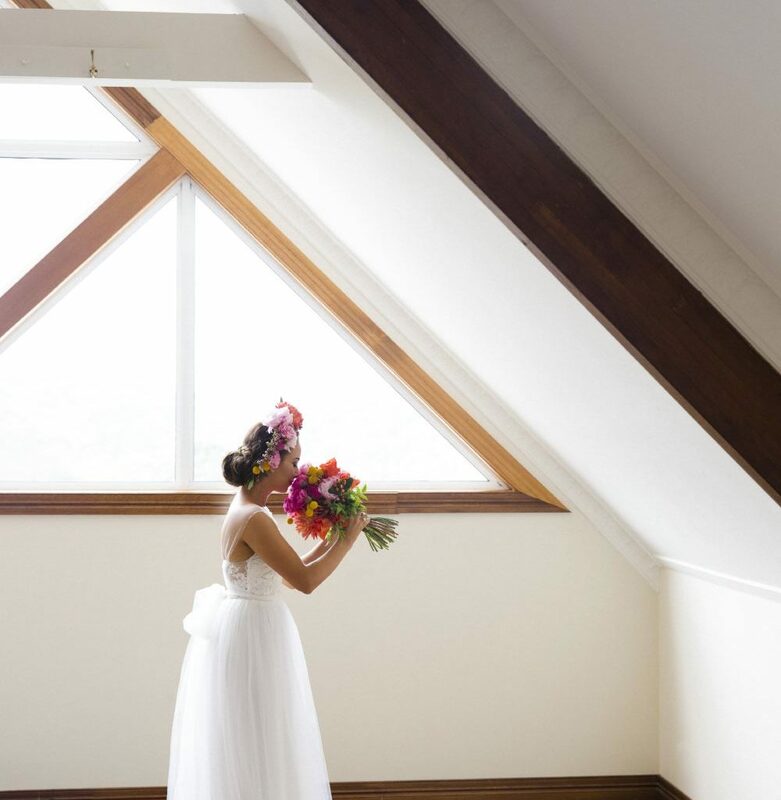 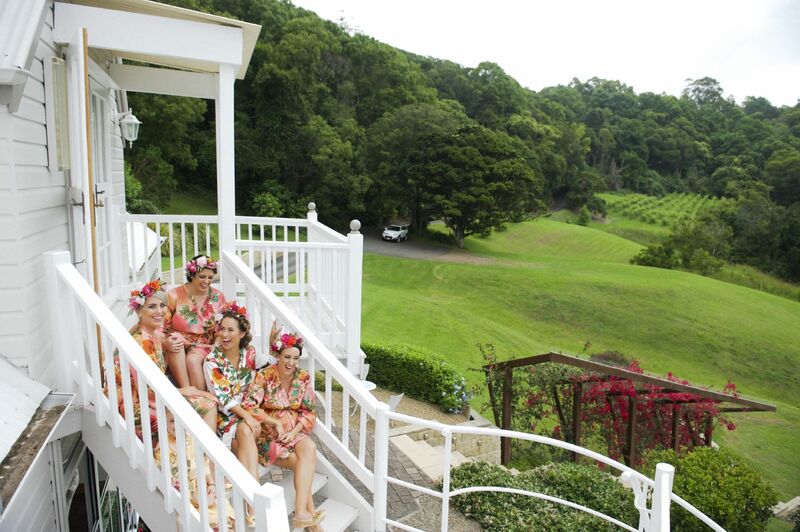 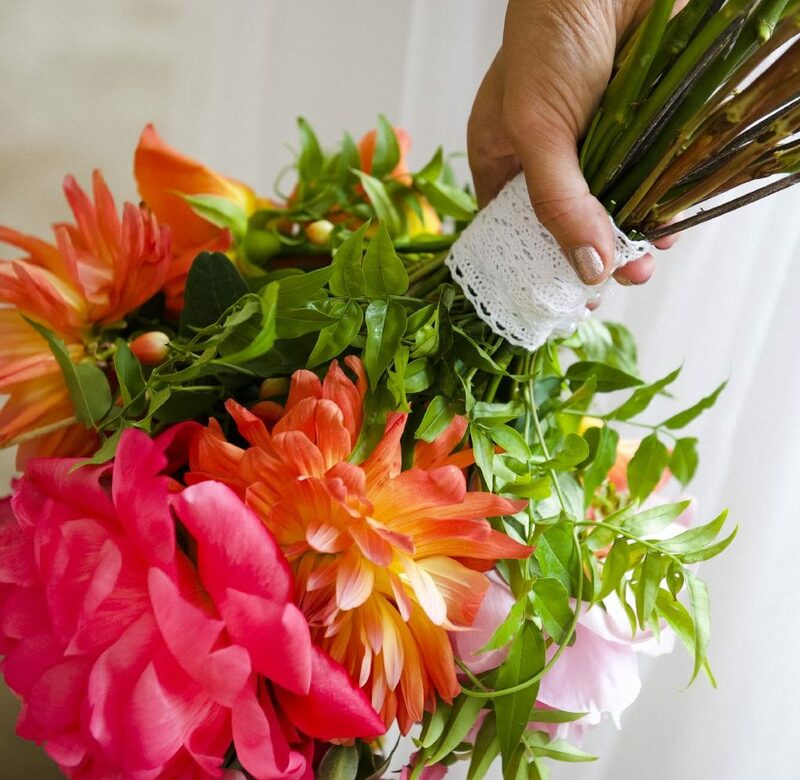 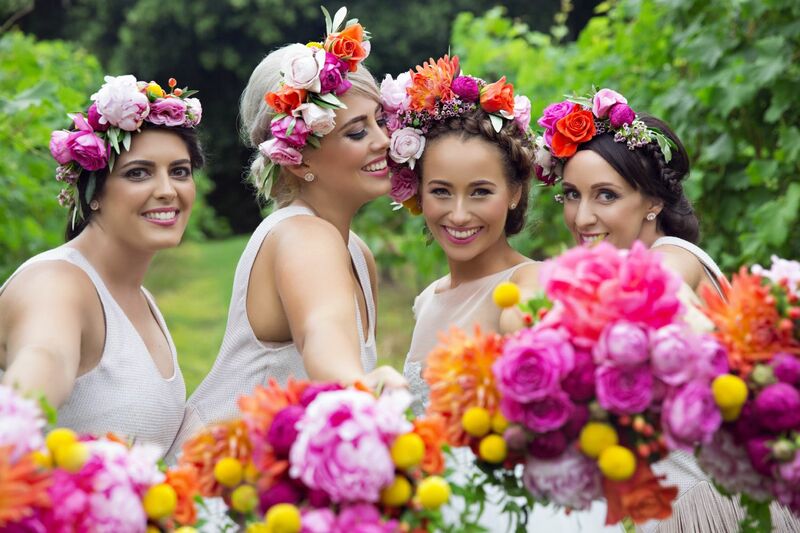 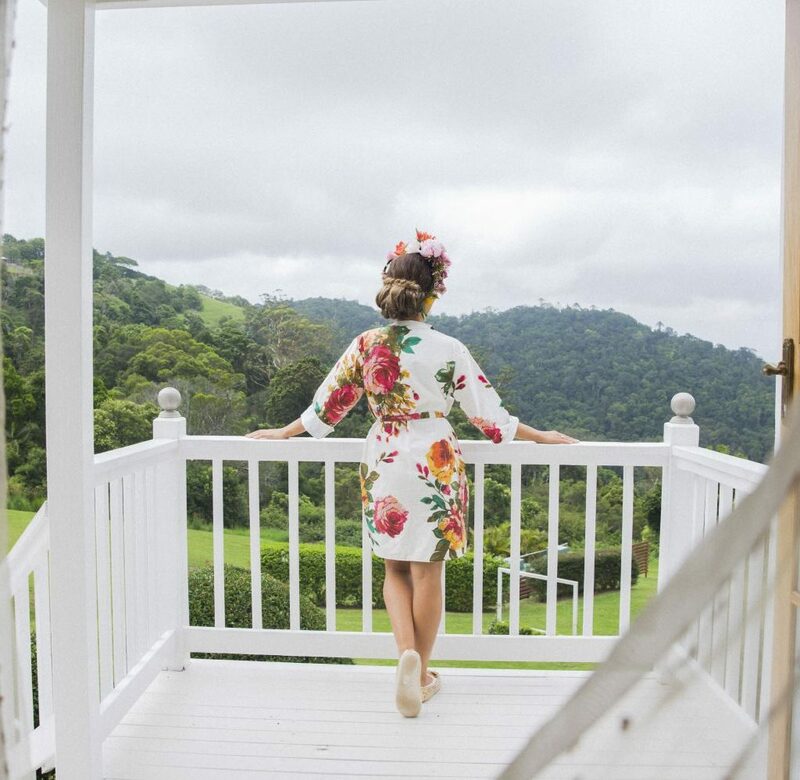 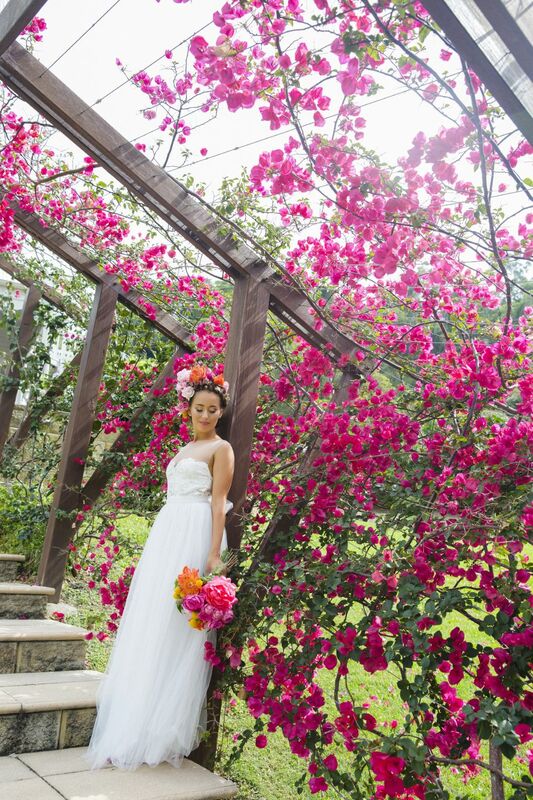 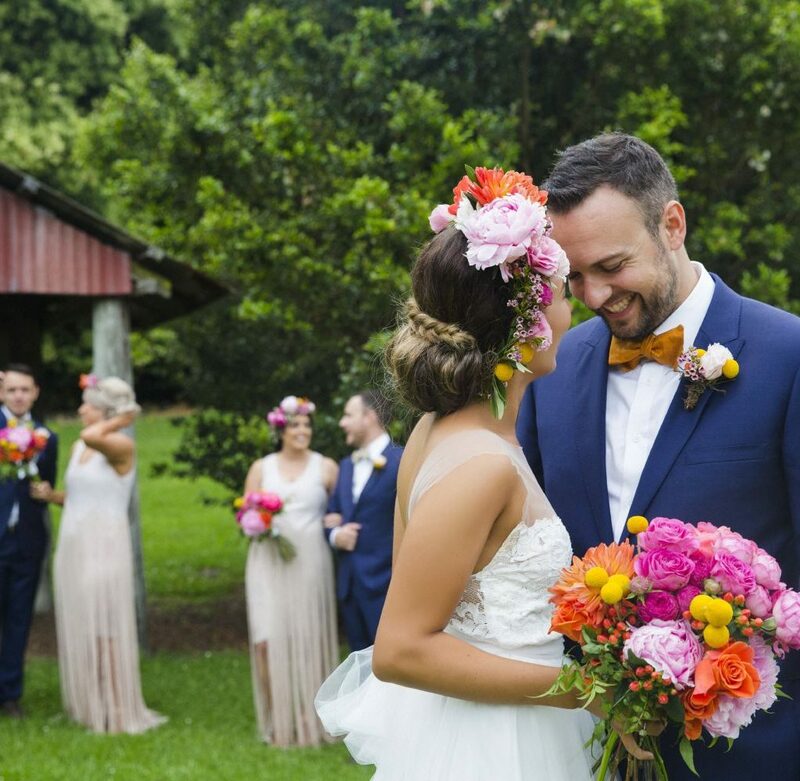 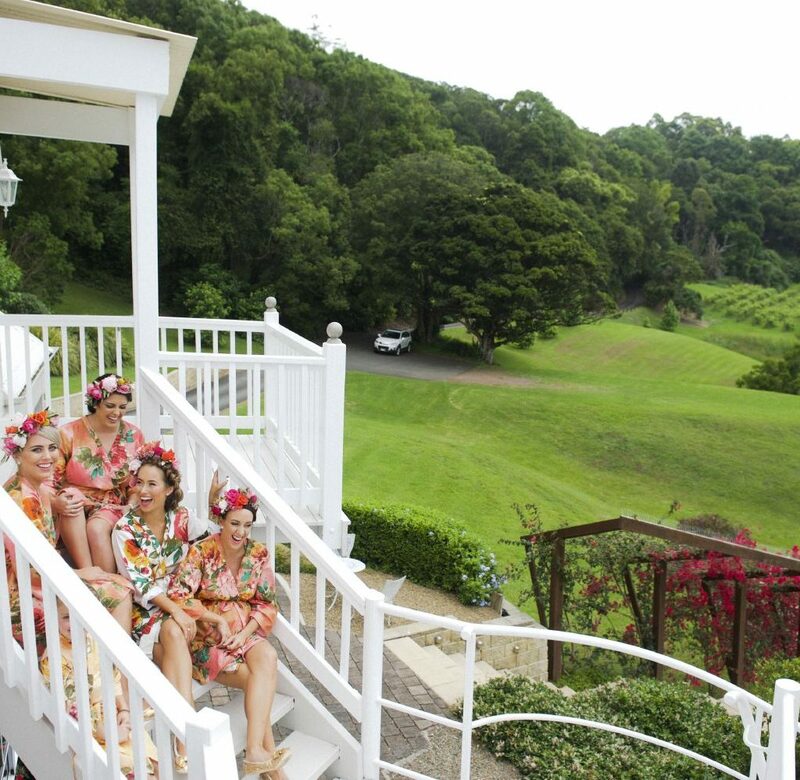 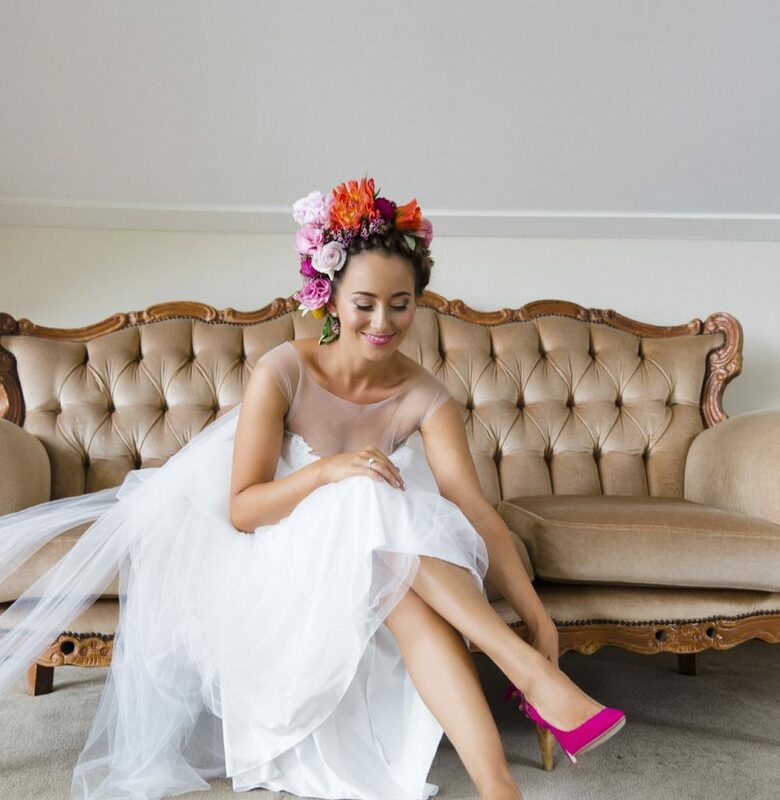 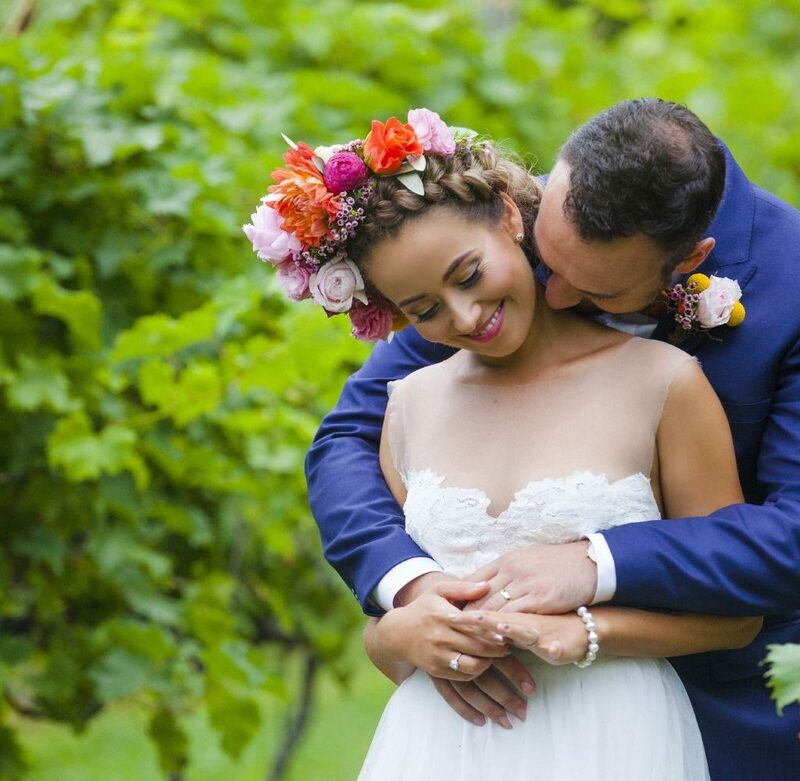 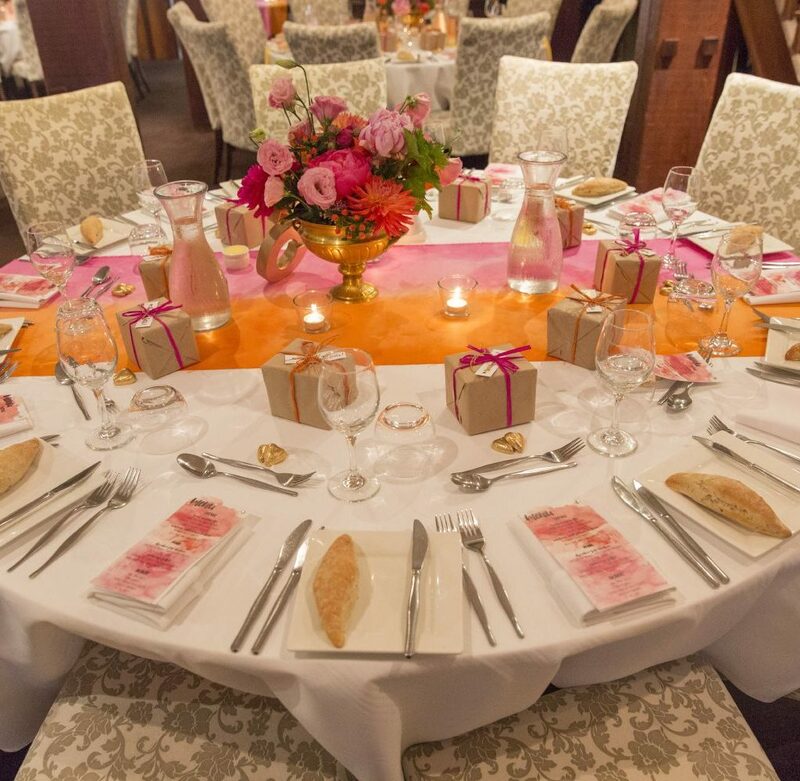 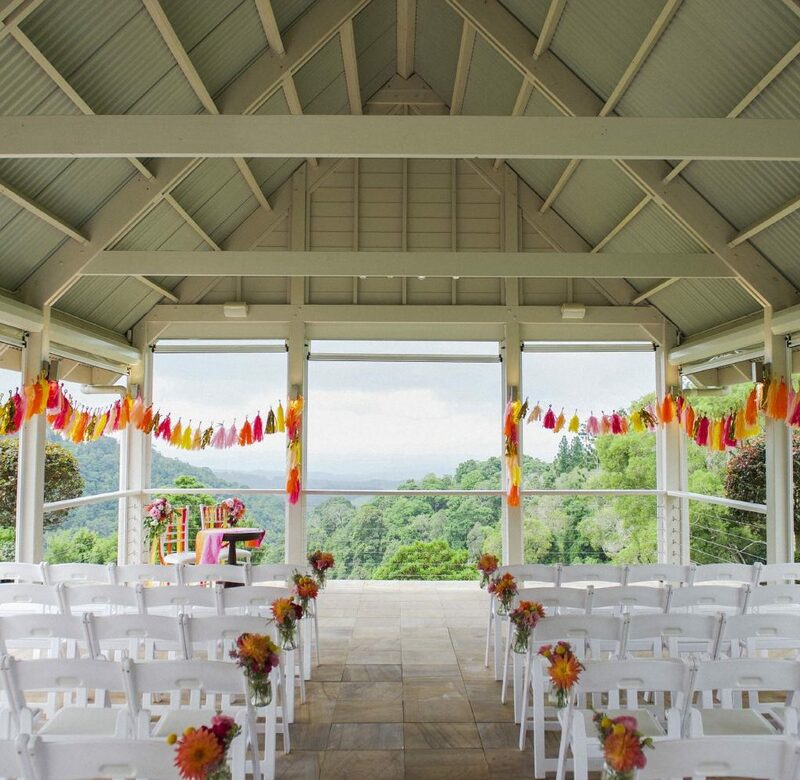 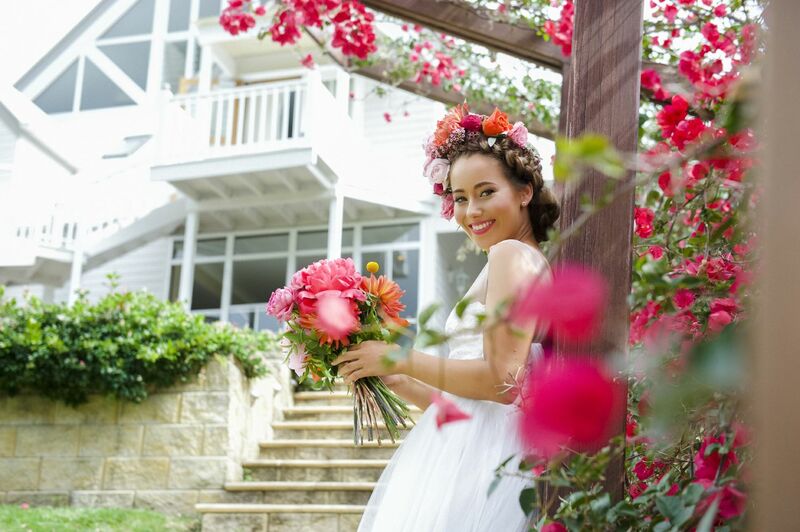 My goodness we love the opportunity to work with bright and colourful blooms, and for this particular celebration we certainly had a wow of a time creating the floral focus that highlighted this peony Maleny Manor wedding! 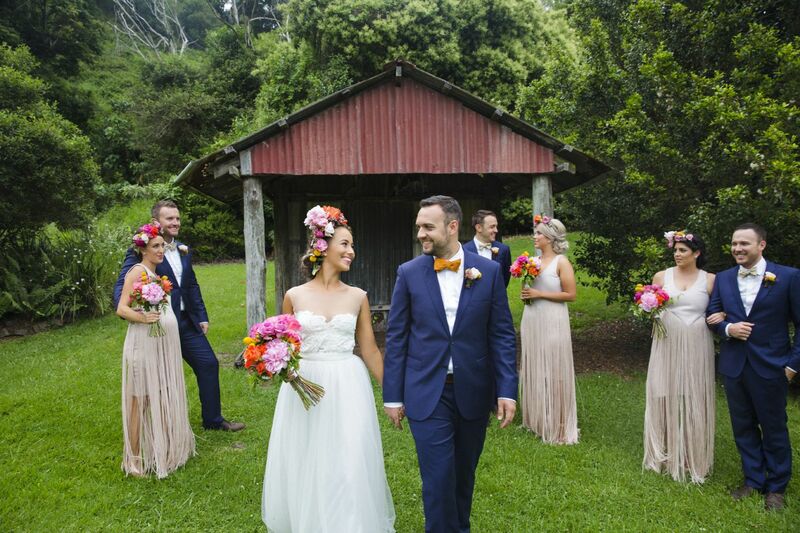 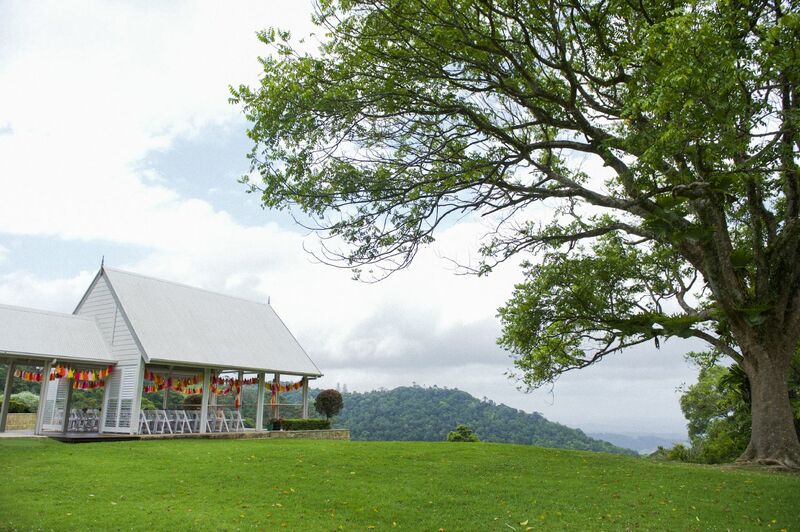 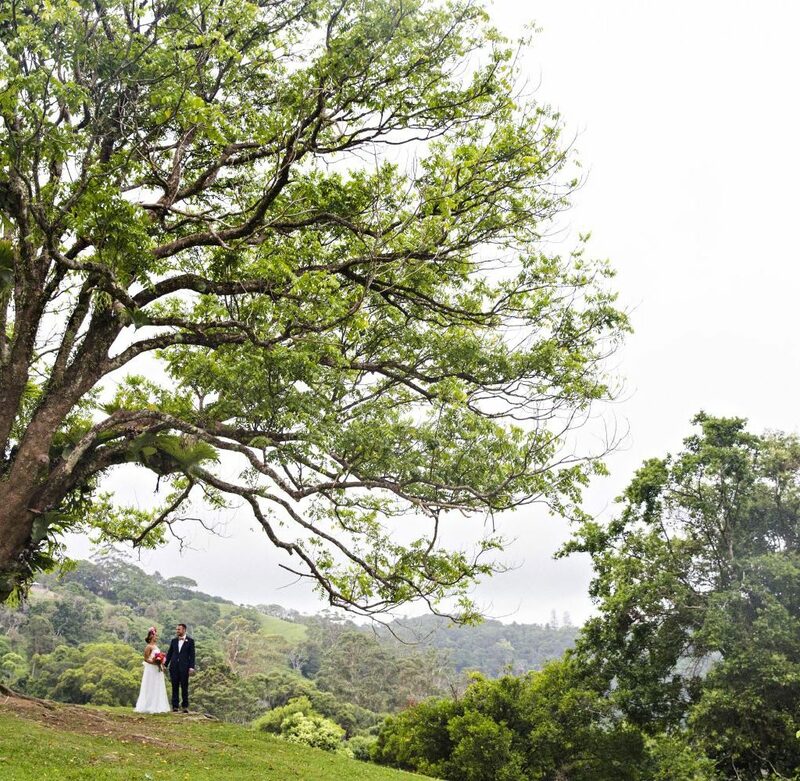 Tamara and Tim were married at the gorgeous hinterland wedding venue in November and so of course peonies were high on their wish list for their feature bloom, and a combination of coral charm and Sarah Bernhardt peonies took centre stage in the designs, and what a delight it was creating the sweet hand held bouquets showcasing those delicious peony blooms. 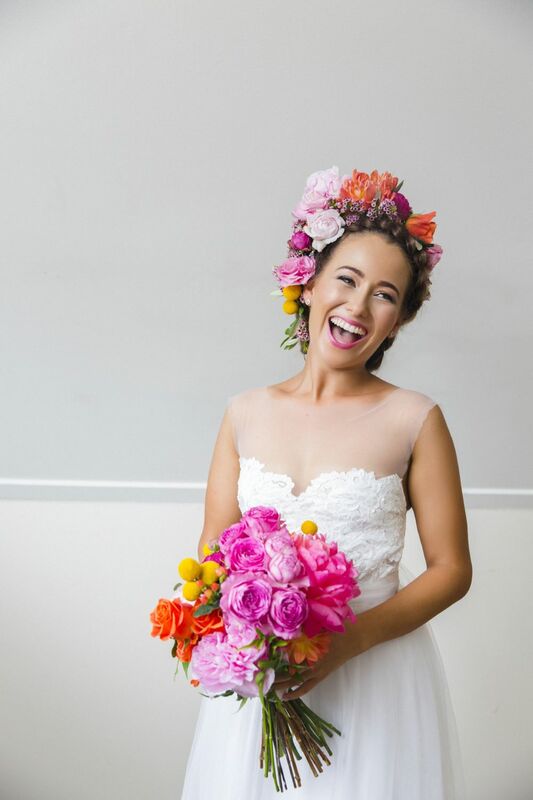 Due to our gorgeous bride’s location, all of our communication with Tamara pre-wedding was via email and as we do with many of our clients we created and designed her floral concept remotely based on her inspiration and her vision for colour, and so it was wonderful to see her ecstatic reaction on the day when we presented her with her bridal box, and she finally got to touch and see her wedding designs. 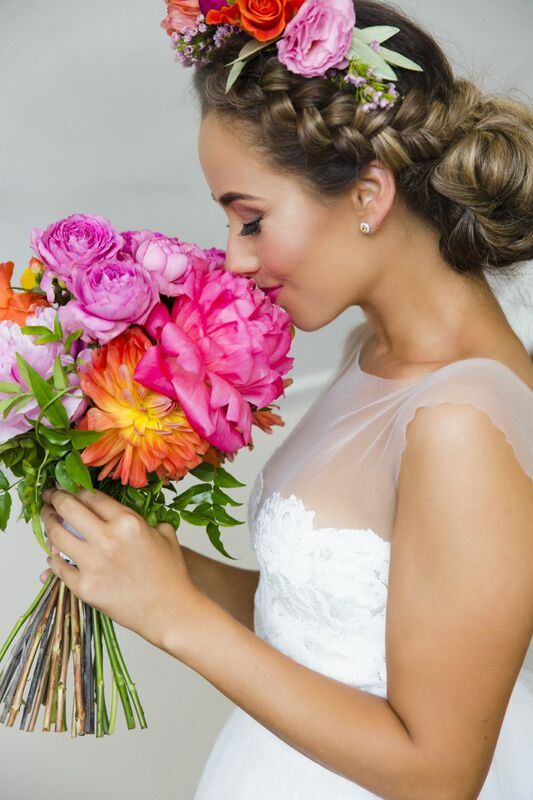 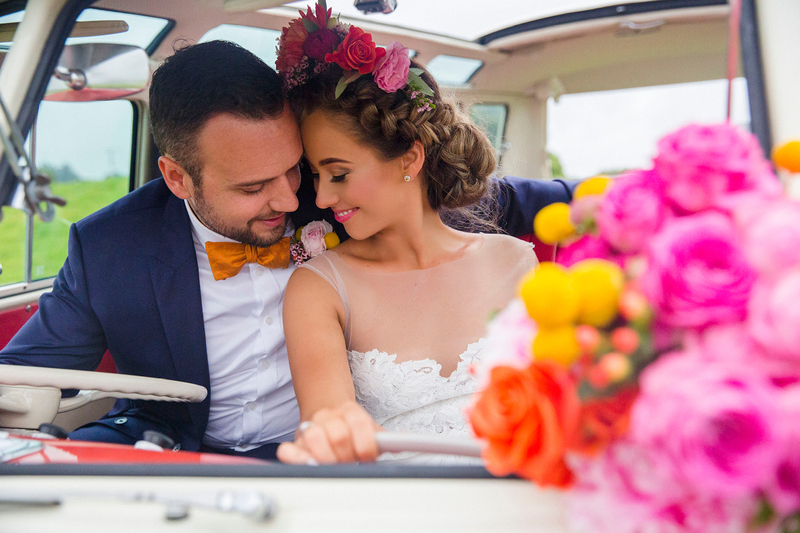 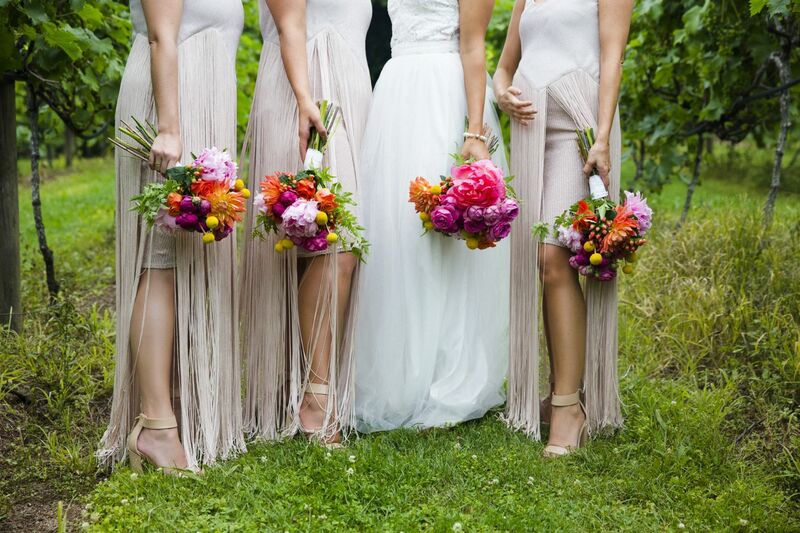 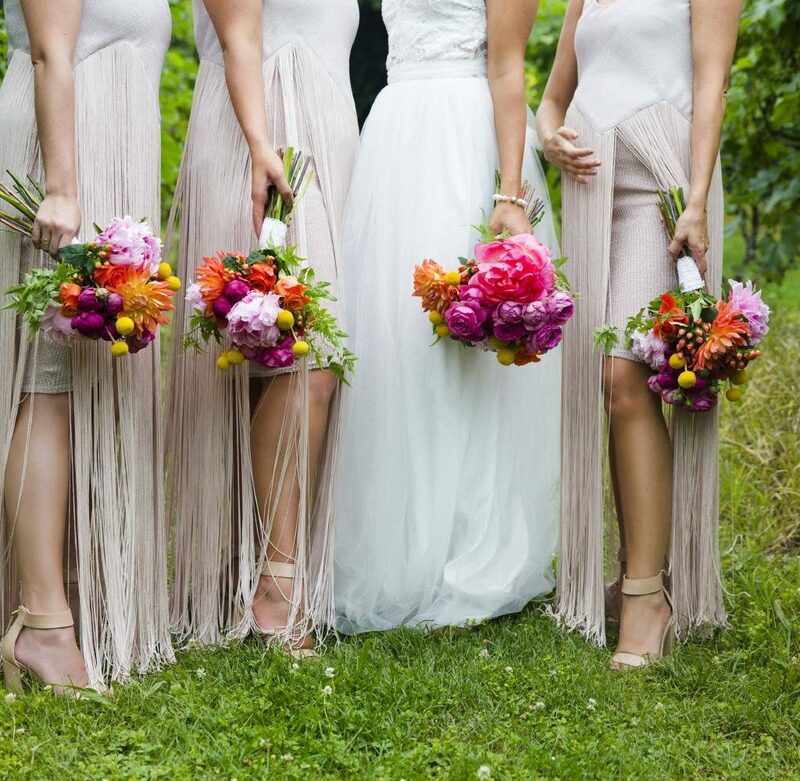 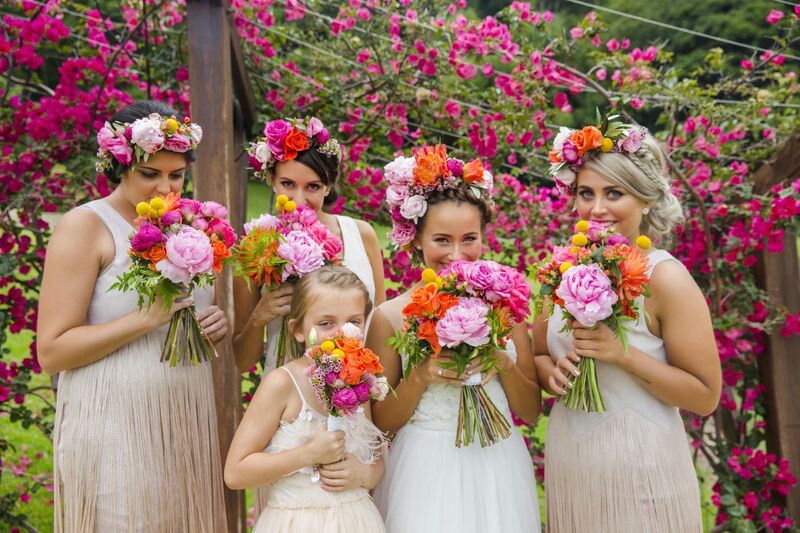 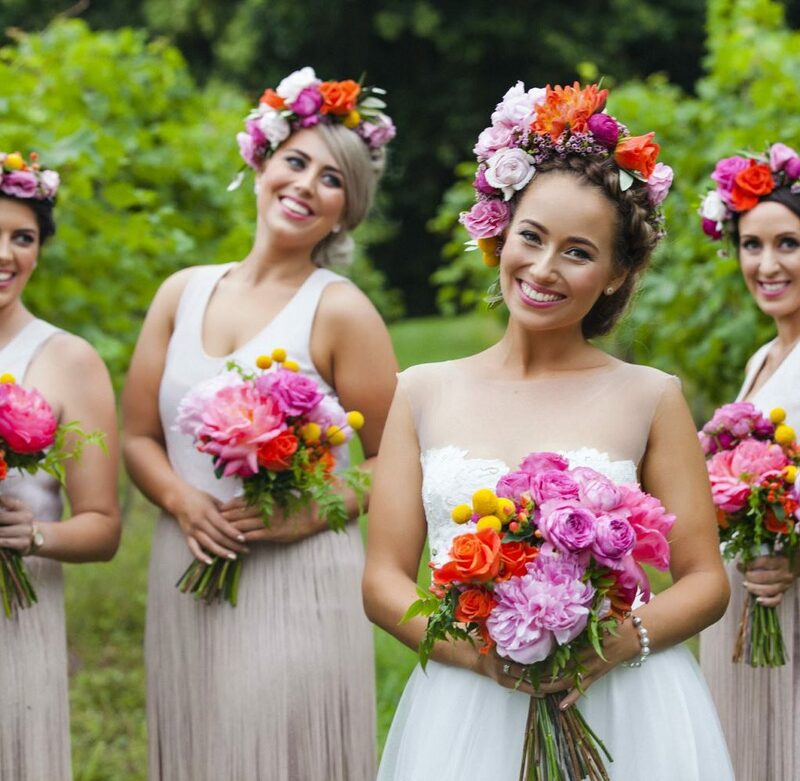 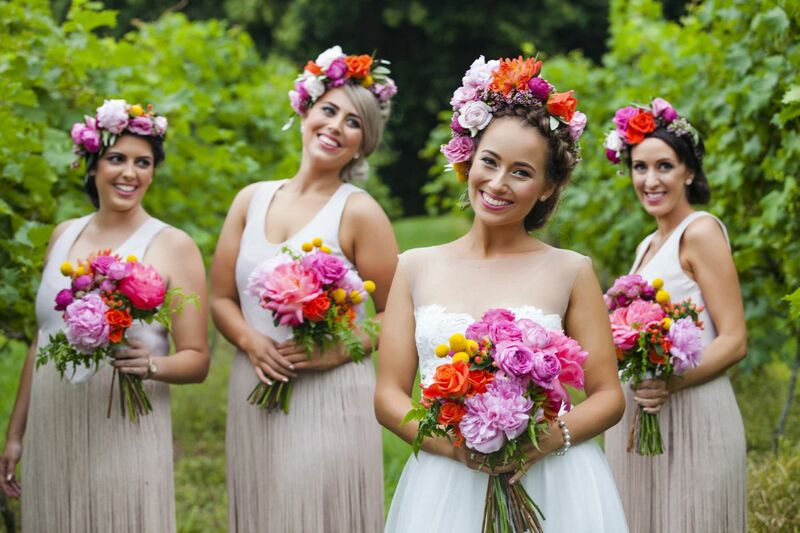 The beautiful bride and her gal pals all wore fabulous flower crowns and we created the beautiful hair garlands with pretty pops of pink, coral and mustard yellow blooms. 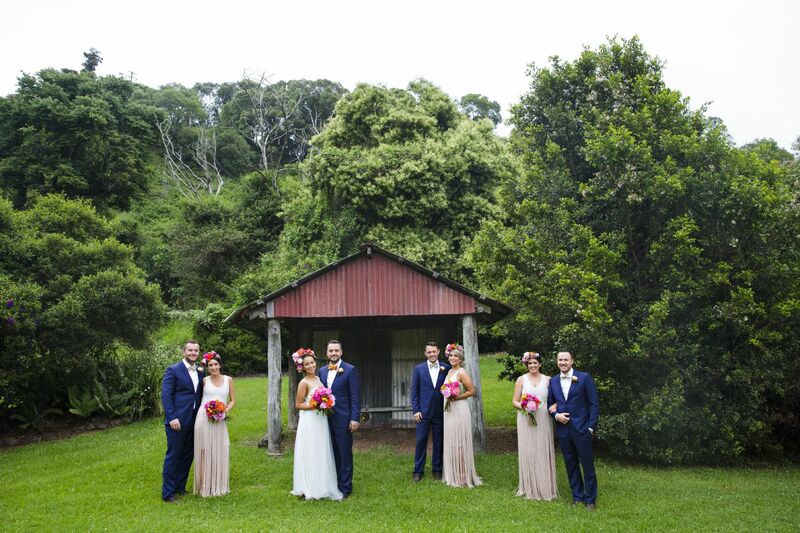 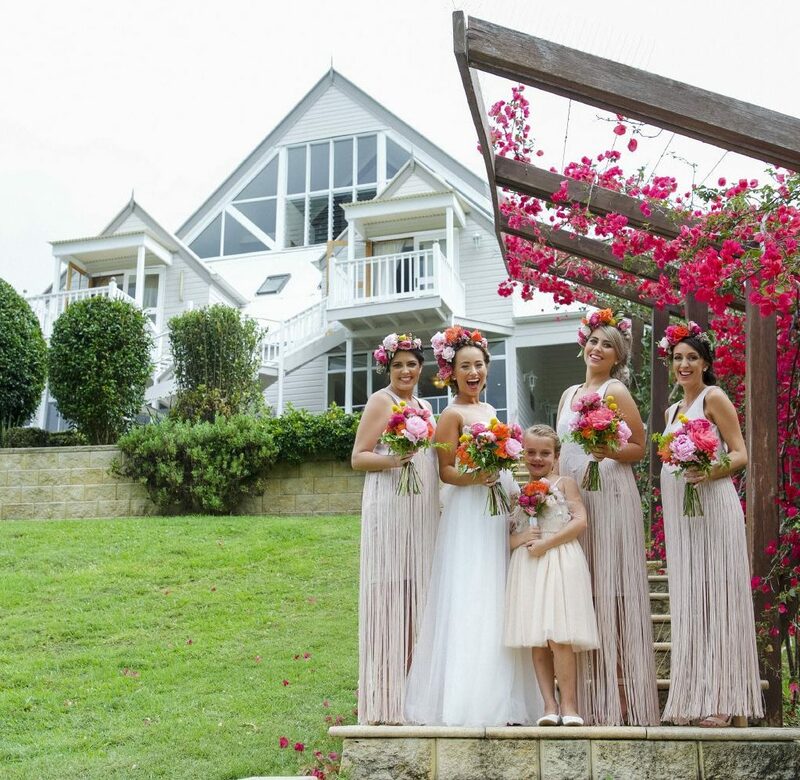 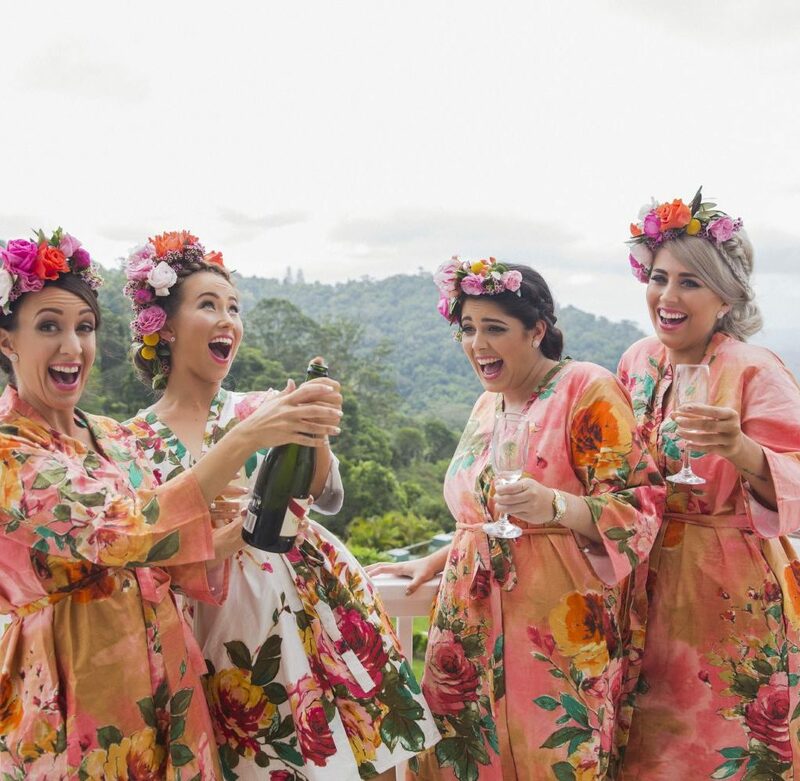 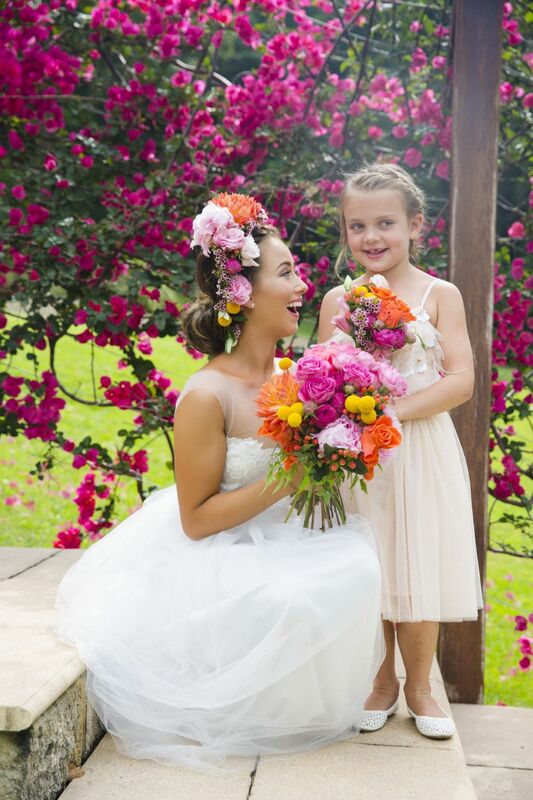 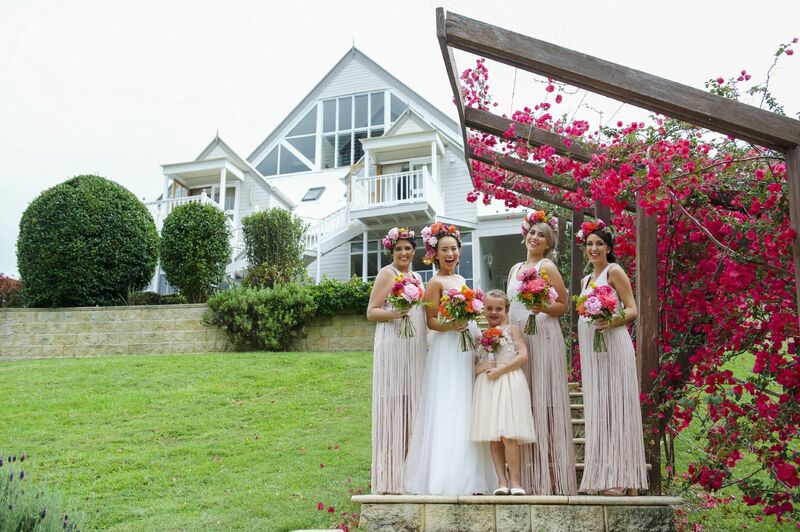 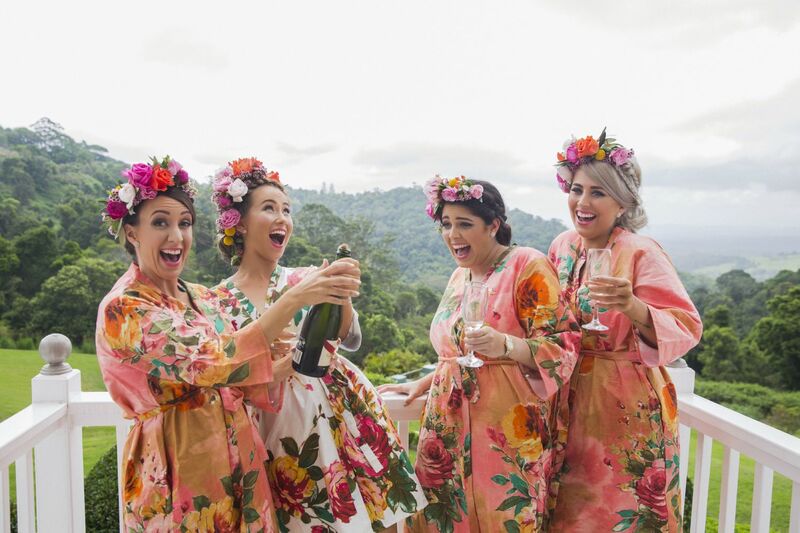 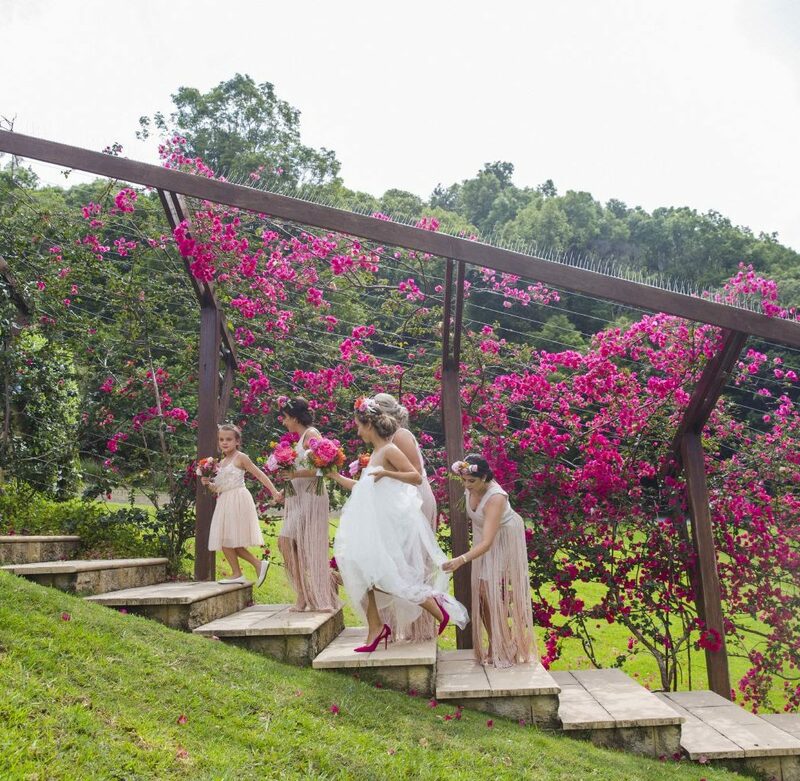 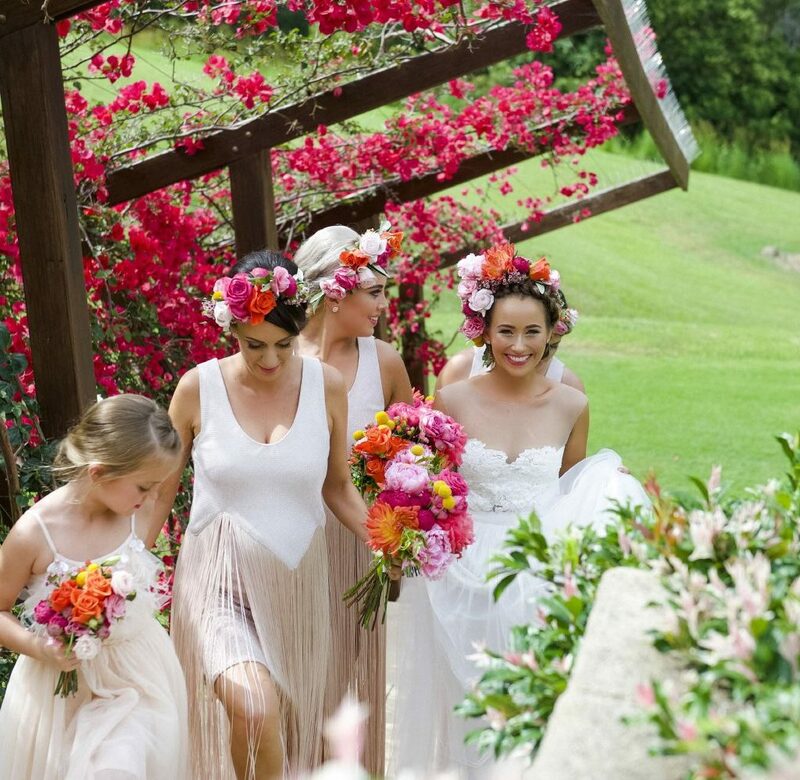 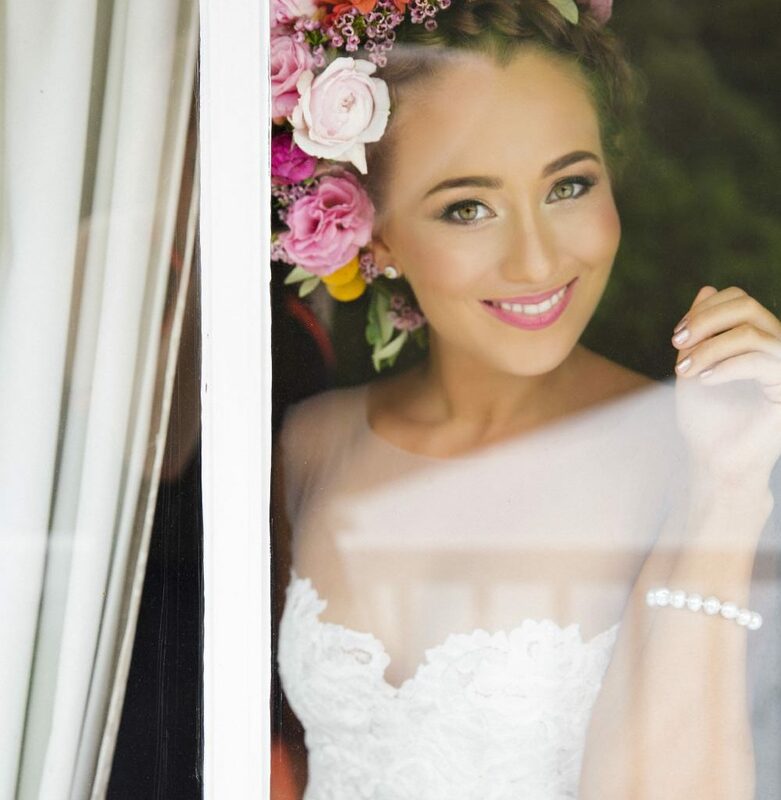 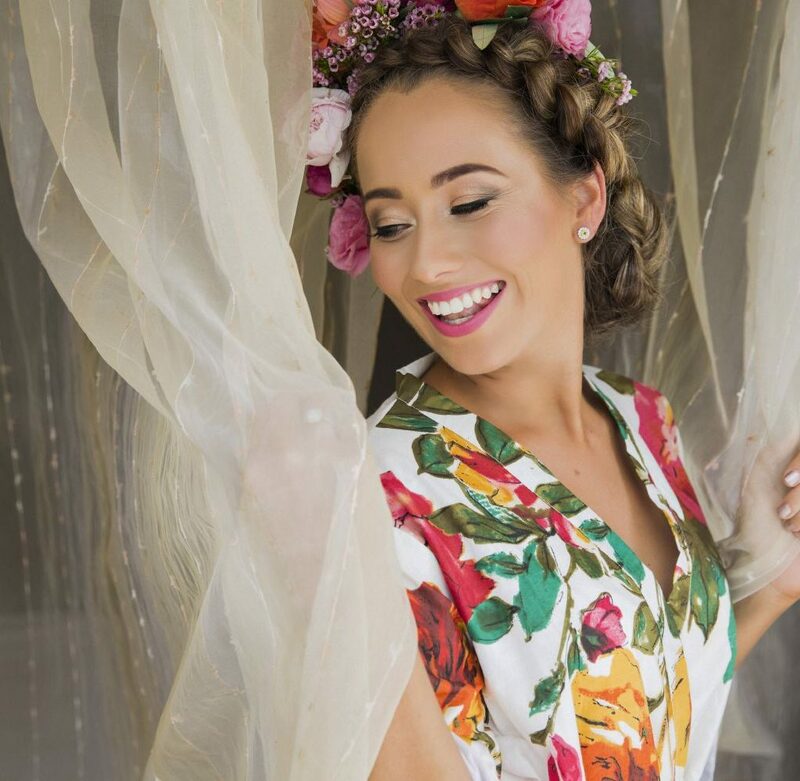 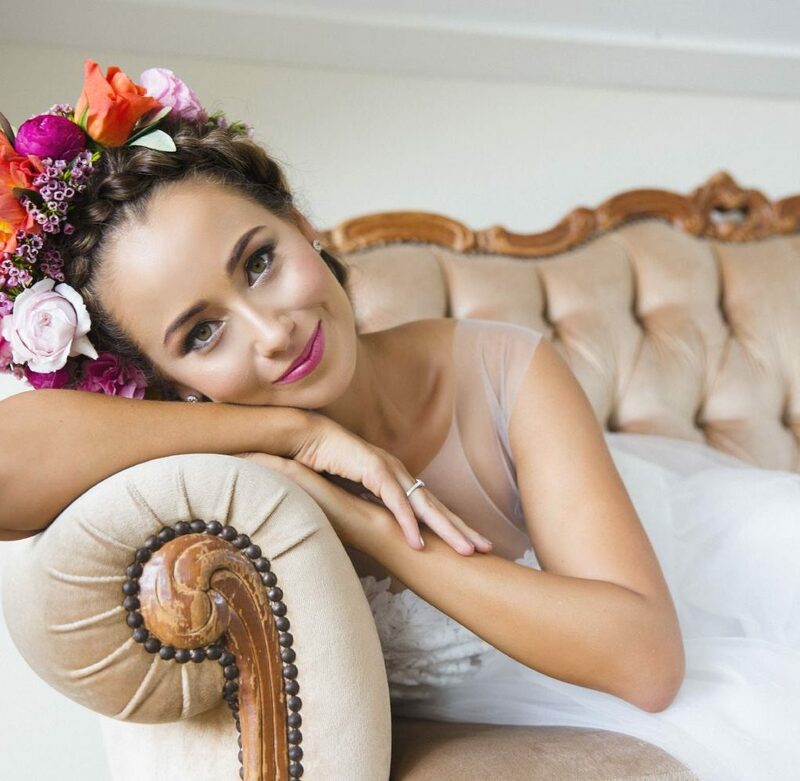 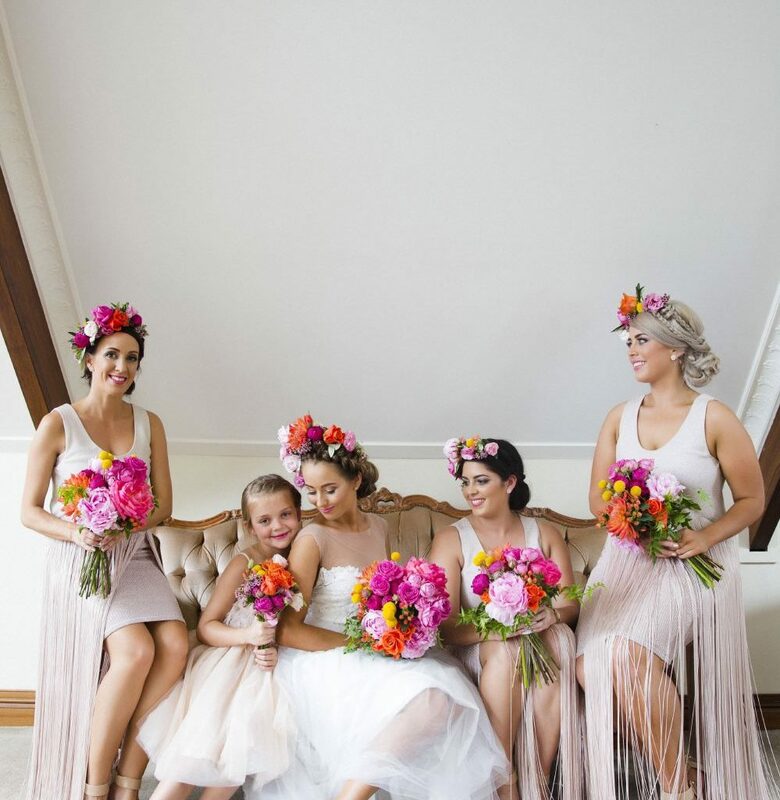 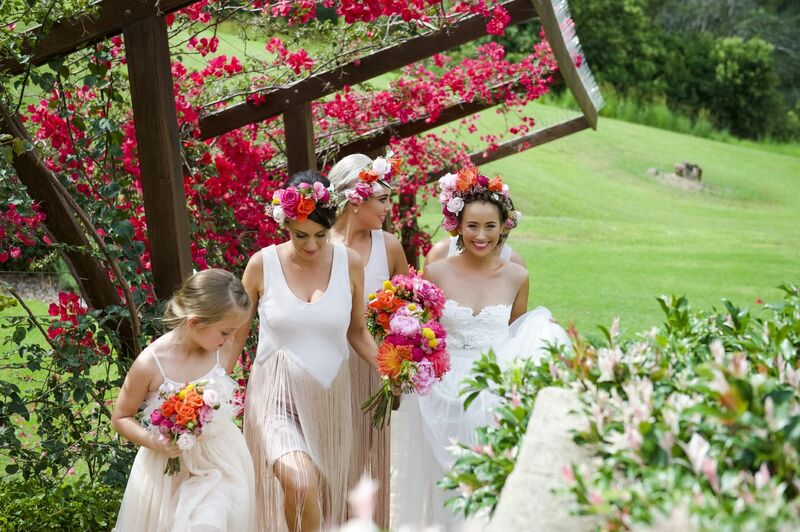 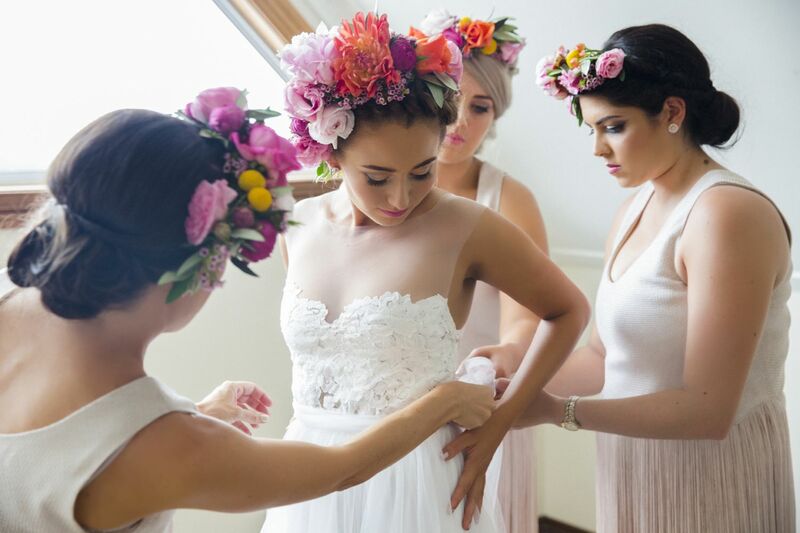 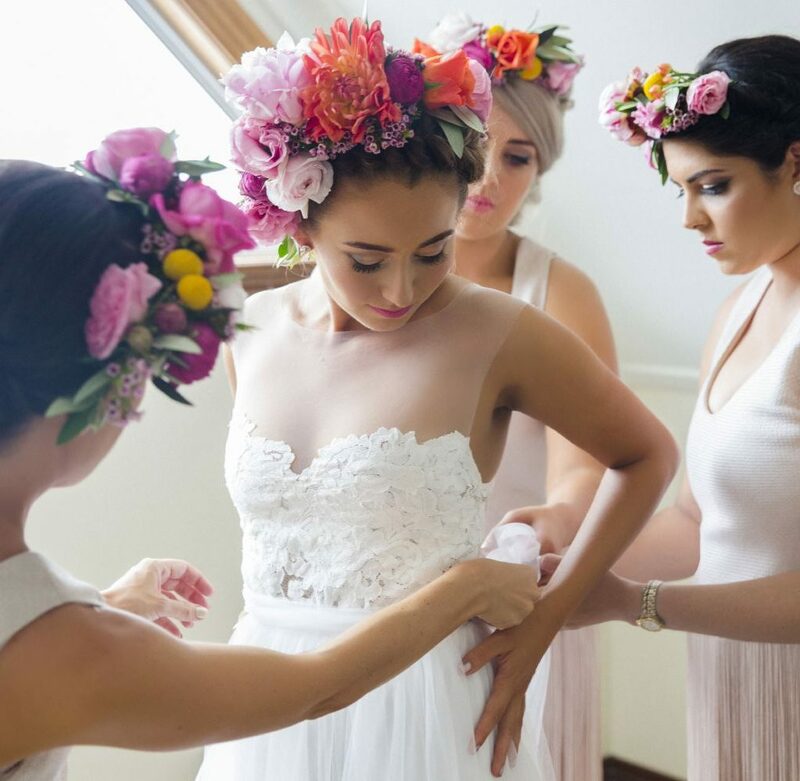 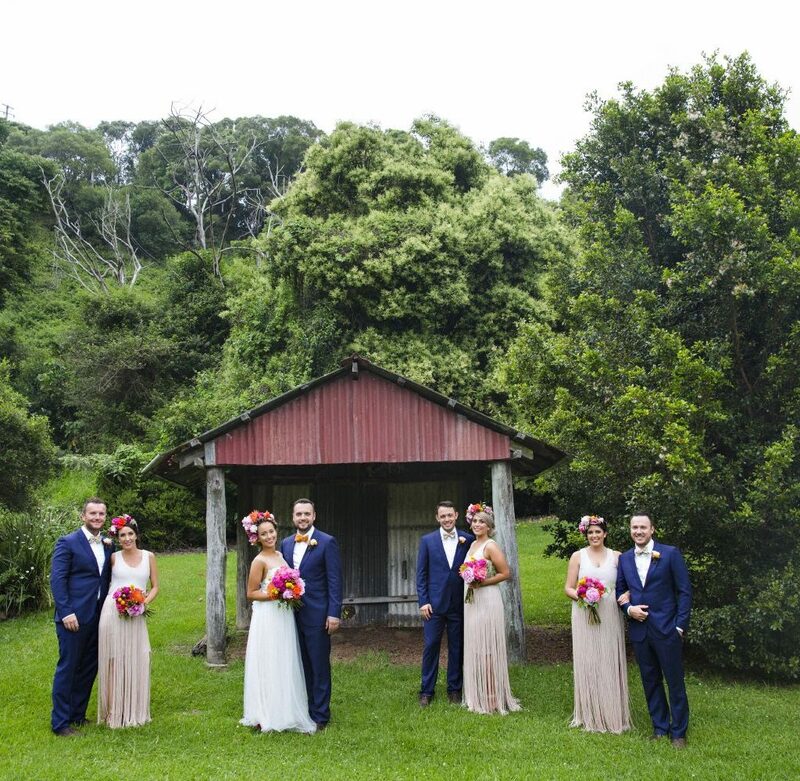 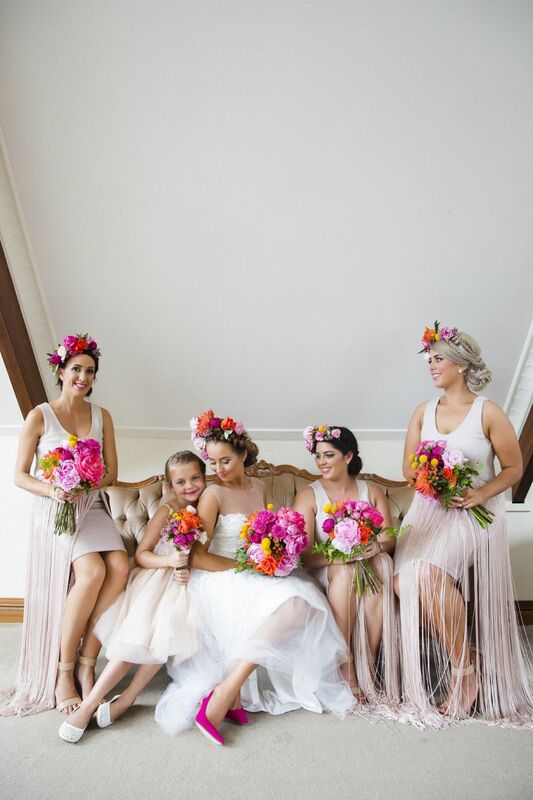 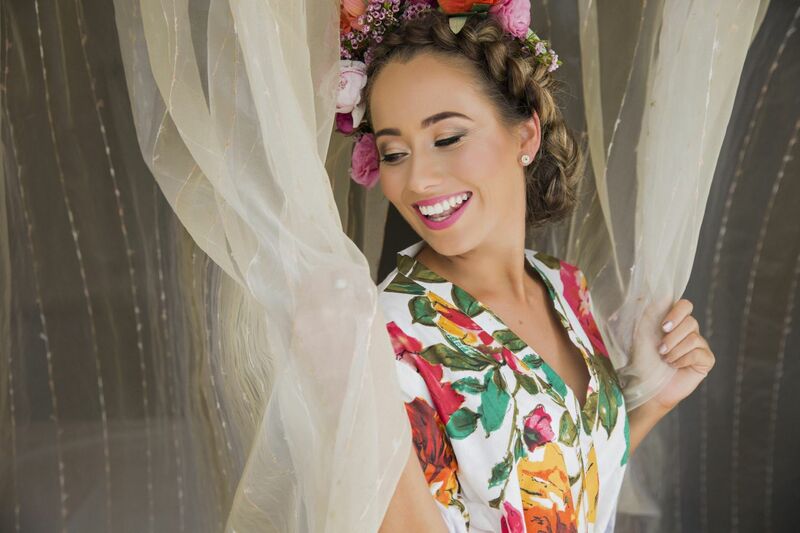 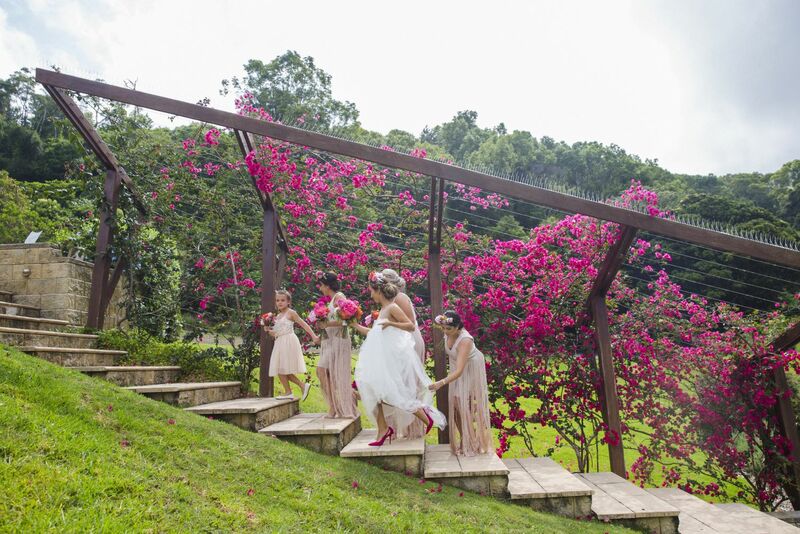 We thought the flower crowns added that extra bit of glamorous wow to the styling, and the vivid pinks and corals combined effortlessly with the blush bridesmaids dresses. 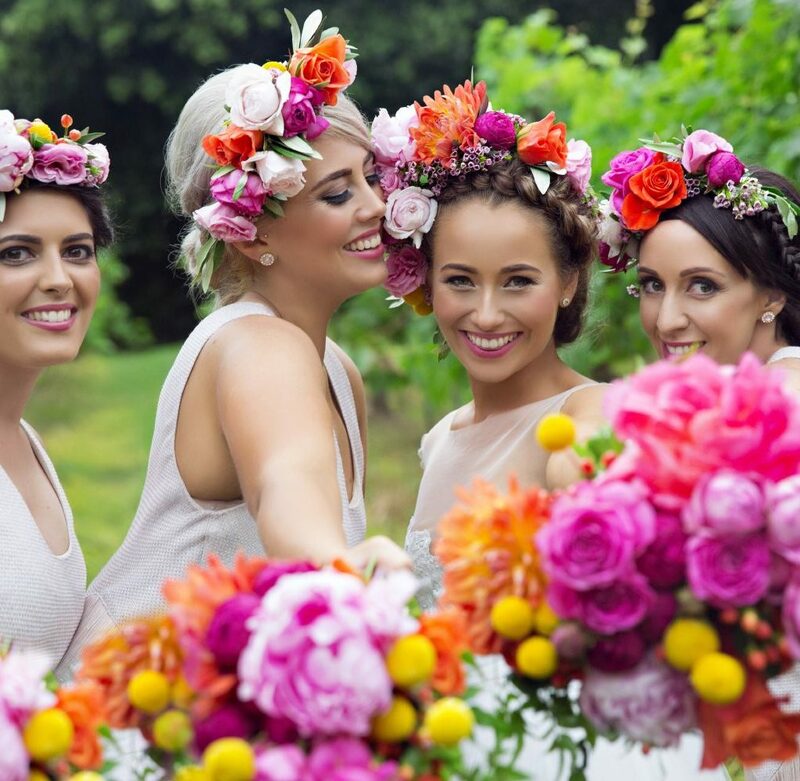 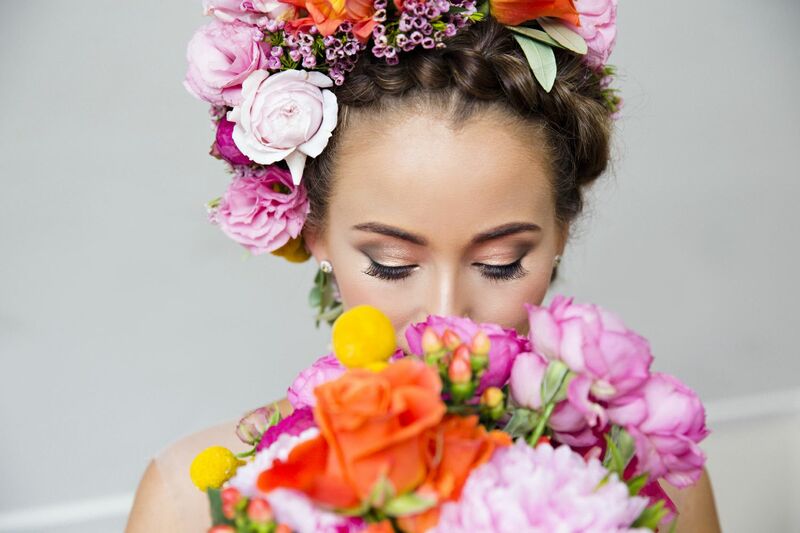 The floral concept showcased the most amazing summer florals, and alongside the beautiful peonies, dahlias, cluster roses, David Austin roses, lisianthus, Billy Buttons, berries and flowering fillers also featured . 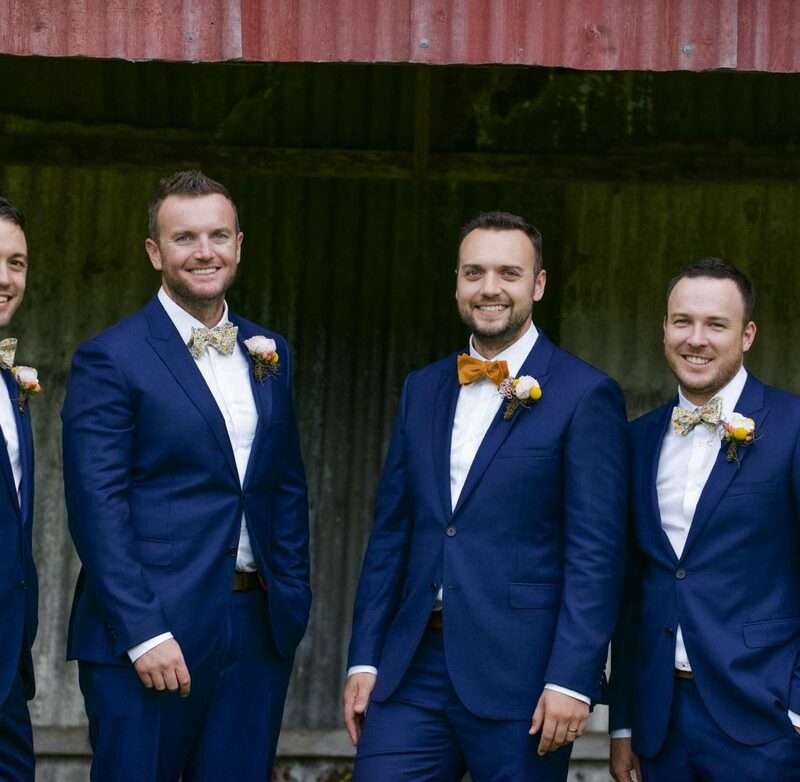 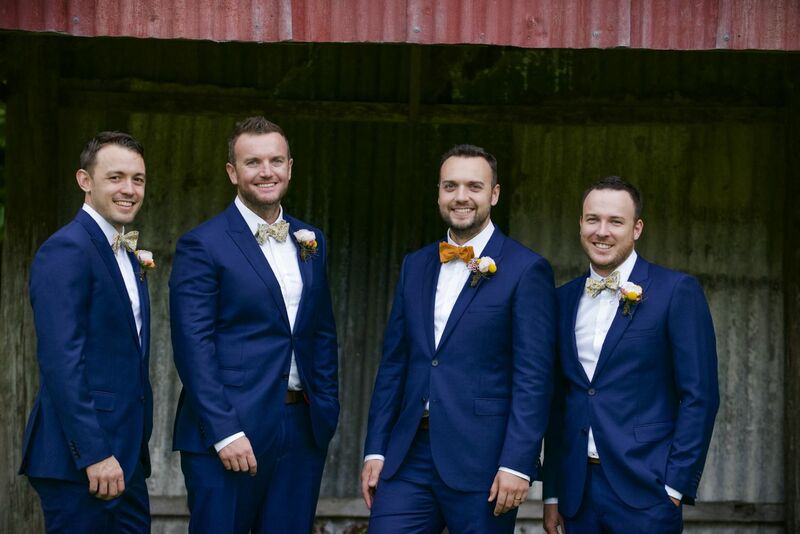 The gents had matching bright eclectic buttonhole designs and the vivid colour popped perfectly against their blue suits. 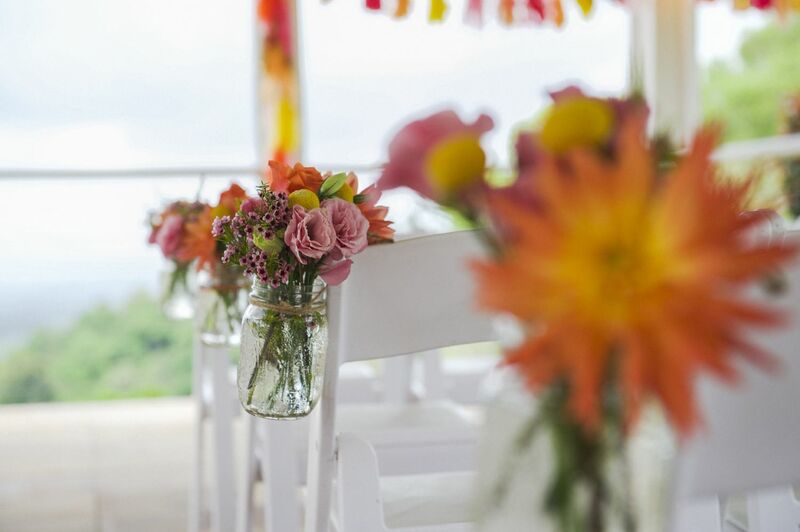 The ceremony featured hand made bunting inspired details created by the bride and her family, and our chair jars of bright blooms lined the aisle ready for the beautiful couple to say ‘I Do’. 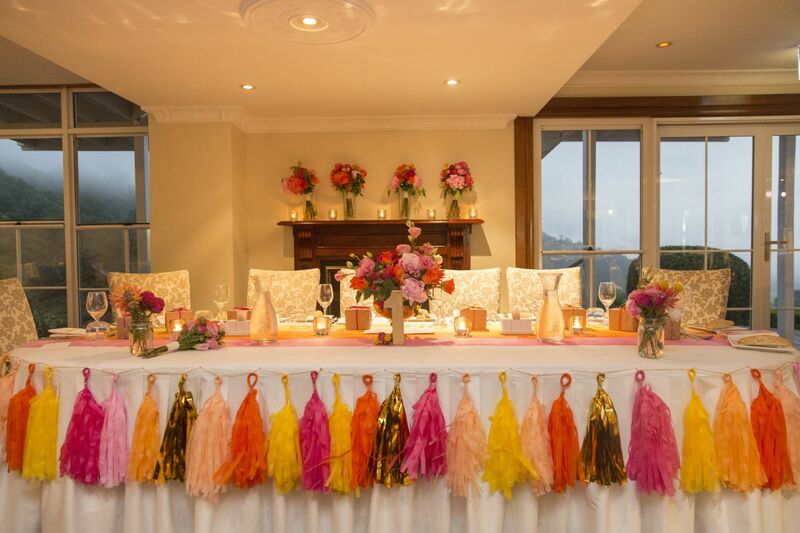 Our antique gold chalice vases featured at reception, each featuring a collection of the beautiful summer blooms showcased through the bouquets, the pretty bright colours of magenta and coral with pops of yellow and pink combined beautifully with the additional colourful details and table decor at reception.